一种存储器装置包括用于保存数据的核心存储器，例如闪速存储器。 A memory device comprising a core memory for storing data, such as flash memory. 该存储器装置包括第一功率输入端以接收用于给该闪速存储器提供功率的第一电压。 The memory device includes a first input terminal for receiving a power to the flash memory for providing a first power voltage. 另外，该存储器装置包括第二功率输入端以接收第二电压。 Further, the memory means includes a second power input to receive a second voltage. 该存储器装置包括功率管理电路，其被配置成接收该第二电压和获得一个或多个内部电压。 The memory device includes power management circuitry configured to receive the second voltage and the obtaining one or more internal voltages. 该功率管理电路提供或传送该内部电压到该闪速存储器。 The power management circuit provides or transmits the internal voltage to the flash memory. 由该功率管理电路(例如电压转换器电路)产生的并且提供到该核心存储器的不同内部电压使能关于该核心存储器中的单元的操作，例如读取/编程/擦除。 By this power management circuit (e.g., voltage converter circuit) and supplied to generate the internal voltage different from the core memory enable operation with respect to the core memory cells, such as read / program / erase. 当今，许多电子装置包括存储器系统以保存信息。  Nowadays, many electronic devices include memory systems to store information. 例如，一些存储器系统保存数字化的音频或者视频信息以便由相应的媒体播放器来重放。 For example, some memory systems stored digitized audio or video information to be reproduced by a respective media player. 其它存储器系统保存软件和相关的信息以执行不同类型的处理功能。 Other memory systems and associated software stored information to perform various types of processing. 在许多电子装置中，存储器系统通常包括控制器和一个或者多个对应的闪速存储器装置。  In many electronic devices, the memory system typically includes a controller and a flash memory device or a plurality of corresponding. 该控制器典型地包括配置成产生信号到该存储器装置以便保存和检索来自该闪速存储器装置的数据的电路。 The controller typically includes arranged to generate a signal to the memory circuit means to save and retrieve data from the flash memory device. 常规的闪速存储器装置典型地包括单个功率输入引脚以接收来自外部电源的功率。  Conventional flash memory devices typically include a single power input pin to receive power from an external power source. 通常以诸如3.3伏的所选的电压电平接收功率。 Typically receives power at a selected voltage level such as 3.3 volts. 因为与闪速存储器相关联的存取和编程操作要求不同的电压，所以闪速存储器装置典型地被配置成包括一个或者多个功率电压转换器以产生对于操作该闪速存储器装置所必需的任意内部电压。 Since different access requirements and programming operations associated with flash memory voltage, the flash memory device is typically configured to include one or more of the flash memory device of any power necessary to generate a voltage converter for operating internal voltage. 例如，常规的闪速存储器装置典型地包括功率转换器电路以将3.3伏的输入转换成其它内部使用的电压，例如5伏、7伏、12伏等等。 For example, conventional flash memory devices typically include power converter circuitry to convert the 3.3 volt input to other internally used voltages such as 5 volts, 7 volts, 12 volts and the like. 在常规的存储器装置中存在与产生内部功率信号相关联的某些不足。  some failure signal and generating an internal power associated with the conventional memory device. 例如，如上讨论的，常规存储器装置现在使用例如3.3伏的单个初级输入电压，以便给存储器装置中的闪速存储器提供功率。 For example, as discussed above, conventional memory devices now use a single primary input voltage of 3.3 volts, for example, to provide power to the flash memory in the memory device. 在内部，该3.3伏的输入被转换成多个较高电压电平，其被使用于例如从闪速存储器读取数据、编程该闪速存储器、擦除该闪速存储器等操作。 Internally, the 3.3 volt input is converted into multiple higher voltage level, which is used, for example, reading data from the flash memory, programming the flash memory, the erase operation of the flash memory or the like. 为了将该初级输入电压转换成较高电压，常规的存储器装置典型地包括一个或者多个所谓的电荷泵电路。  In order to convert the primary input voltage to a higher voltage, conventional memory devices typically comprise one or more so-called charge pump circuit. 在操作期间，一个或者多个电荷泵的每一个将该初级输入电压(即3.3伏)转换成特定的较高电压电平以便被该闪速存储器使用以执行不同的存储器操作。 During operation, each of the one or a plurality of the primary input voltage of the charge pump (i.e., 3.3 volts) is converted into a specific higher voltage level to the Flash memory are used to perform different memory operations. 通常，电荷泵的转换效率对于在输入电压和所产生的输出电压之间的较大差异呈指数地变差。  Generally, the conversion efficiency of the charge pump for the large difference between the input voltage and the output voltage generated exponentially deteriorated. 例如，将3.3伏的输入转换成20伏的输出的电荷泵的转换效率低于将3.3伏的输入转换成7伏的输出的电荷泵的转换效率。 For example, to convert an input of 3.3 volts to 20 volts charge pump output conversion efficiency of less than 3.3 volts will convert the input to a 7 volt output conversion efficiency of the charge pump. 当前存在生产在越来越低的电压下操作的电路装置的趋势。  Trend circuit means operating at increasingly low voltages produced currently exist. 例如，之前的技术要求5伏的电源以操作对应的存储器装置的核心存储器。 For example, prior to the technical requirements of the 5 volt power supply to operate core memory of a corresponding memory device. 如上提及的，常规的闪速存储器装置的技术当前要求3.3伏的电源以便给对应的核心存储器提供功率。 As mentioned above, conventional flash memory device technology currently requires a 3.3 volt power supply for providing power to the corresponding core memory. 期望未来的存储器装置将在例如1.8伏的输入或者甚至更低的功率源下操作。 Desired future memory devices will operate under the input of 1.8 volts, for example, or even lower power source. 当前，执行关于核心存储器的存储器操作所要求的高电压没有随着为核心存储器提供功率所要求的电压成比例减小。 Currently, the high voltage of the memory operation performed on the memory core is not reduced as required to provide the required power is proportional to the voltage of the memory core. 换句话说，即便核心存储器在例如1.8伏的较低电压下操作，该核心存储器可能仍然要求在5和20伏之间范围的电压以便执行存储器操作。 In other words, even if the core memory operates at a lower voltage of 1.8 volts, for example, the core memory may still require a voltage in the range between 5 and 20 volts to perform memory operations. 配置核心闪速存储器在例如1.8伏(或者甚至更低)的低电压下操作，这降低了给该核心存储器装置提供功率所花费的功率量。  The flash memory core configuration at a low voltage, for example 1.8 volts (or even lower) operation, which reduces the amount of power provided to the power spent core memory device. 然而，将该低或较低的电压输入(例如1.8伏)转换成例如在5和20伏之间的相同范围的较高电压以便能够使存储器操作，这将导致减小转换器效率、提高将1.8伏转换成较高电压的范围所要求的相应电荷泵电路的尺寸和复杂度的负面影响，和/或降低存储器装置的读取/编程/擦除性能。 However, this low or lower voltage input (e.g., 1.8 volts) to a higher voltage, for example, in the same range of between 5 and 20 volts to enable memory operations, which will result in reduced efficiency of the converter, will increase converting a negative impact in a range of 1.8 volts to a higher voltage required to charge pump circuit corresponding to the size and complexity, and / or reduce read / program memory device / erasing performance. 通常，这里的实施例包括存储器装置和/或存储器系统，其克服了上面讨论的不足，和/或本领域中已知的其它不足。  In general, embodiments herein include a memory device and / or memory system that overcomes the deficiencies discussed above, and / or other deficiencies known in the art. 例如，根据这里的实施例，存储器装置包括核心存储器以用于保存数据，例如闪速存储器。 For example, according to embodiments herein, the core memory device comprising a memory for saving data, such as flash memory. 该存储器装置包括第一功率输入端以接收用于至少提供功率给该核心存储器(例如闪速存储器)的第一电压。 The memory device includes a first power input to receive power to provide at least for the core memory (e.g., flash memory) of a first voltage. 另外，该存储器装置包括用于接收第二电压的第二功率输入端。 Further, the memory means comprises a second input for receiving a second power voltage. 在存储器装置中的功率管理电路(例如一个或者多个电压转换器电路)接收第二电压并获得传送到该闪速存储器的一个或多个内部电压。 Power management circuitry (e.g., one or more voltage converter circuits) in the memory device receives the second voltage and get transferred to the flash memory or a plurality of internal voltages. 因此，这里的实施例包括存储器装置，其被配置成具有适当的输入端(例如，功率输入引脚、焊盘、导电路径等)以接收不是仅单一的电压，而是多个不同电压(例如第一电压、第二电压、第三电压等)以用于提供功率给该存储器装置并操作该存储器装置。  Thus, embodiments herein include a memory device, which is configured to have an appropriate input (e.g., power input pins, pads, conductive paths, etc.) to receive not only a single voltage, but multiple different voltage (e.g., a first voltage, second voltage, third voltage, etc.) for providing power to the memory device and operating the memory device. 根据一个实施例，第一电压给存储器装置中的闪速存储器(例如核心存储器)提供功率，同时第二电压功率被“上”转换或者“下”转换成一个或者多个被传送(例如提供)到该闪速存储器以支持下面操作的输入电压，该操作例如:i)编程在该闪速存储器中的单元，ii)擦除在该闪速存储器中的单元，iii)从在该闪速存储器中的单元中读取数据，和iv)编程数据到该闪速存储器的单元。  According to one embodiment, a first power voltage to the memory device is a flash memory (e.g., core memory), while the second voltage power is "on" conversion or "under" is converted into one or more transmitting ( provided, for example) to the flash memory to support the input voltage following the operation, the operation example: i) programming unit in the flash memory, ii) erasing of the flash memory cells, III) from the flash memory cell read data, and iv) programming data to cells of the flash memory. 也就是，该所接收的第二电压能够被“下”转换成一组一个或者多个被用于执行关于该核心存储器的操作的较低电压。 That is, the received second voltage can be "down" into a set of one or more lower voltages used to perform the operation with respect to the core memory. 另外，或者作为可选择的，该第二电压能够被“上”转换成一组一个或多个被用于执行关于该核心存储器的操作的较高电压。 In addition, or as an alternative, the second voltage can be "on" into a set of one or more higher voltages used to perform the operation with respect to the core memory. 为了转换该第二电压为较高电压，功率管理电路(例如功率转换器电路)可以包括一个或者多个电荷泵电路，其将该第二电压转换成大于该第二电压的一个或多个电压。  In order to convert the second voltage is a higher voltage, the power management circuitry (e.g., power converter circuitry) can include one or more charge pump circuits that convert the second voltage is larger than the second voltage to one or a plurality of voltage. 例如，该第一电压可以是1.8伏或3.3伏；该第二电压可以是大约5伏或者更大，但是这些电压将根据应用场合而改变。 For example, the first voltage may be 1.8 volts or 3.3 volts; the second voltage may be about 5 volts or more, but these voltages will vary depending on the application. 该功率管理电路接收该第二电压(例如5伏)并且将其转换至IJ不同电压电平的范围内，例如7伏、10伏、18伏和/或20伏。 Within the range of the power management circuit receives the second voltage (e.g. 5 volts) and converts it to a different voltage level IJ, e.g. 7 volts, 10 volts, 18 volts and / or 20 volts. 再次注意到，这些内部产生的电压能够被提供给闪速存储器以支持关于在该存储器装置中的闪速存储器的不同类型的数据存取操作。 It is again noted that these internally generated voltages can be supplied to the flash memory to support different types of data on the flash memory in the memory device access operation. 在进一步的实例性实施例中，该存储器装置中的功率管理电路包括一个或者多个电荷泵电路。  In a further exemplary embodiment, the memory device or the power management circuitry comprises a plurality of charge pump circuits. 例如，该功率管理电路可以包括用于将第二电压转换成高于该第二电压(例如5伏)的第一内部电压(例如7伏)的第一电荷泵电路以及用于将该第二电压(例如5伏)转换成高于该第一内部电压(例如7伏)的第二内部电压(例如10伏)的第二电荷泵电路。 For example, the power management circuit may include means for converting the second voltage is higher than the second voltage (e.g. 5 volts) in a first internal voltage (e.g. 7 volts) of the first charge pump circuit and a second voltage (e.g. 5 volts) to a higher than the first internal voltage (e.g. 7 volts) in a second internal voltage (e.g. 10 volts) of the second charge pump circuit. 如上所提及的，该第一内部电压和该第二内部电压可被用于支持关于该闪速存储器的不同数据存取操作。  As mentioned above, the first internal voltage and the second internal voltage can be used to support different data access operations with respect to the flash memory. 例如，第一内部电压可以是被用于支持关于在该闪速存储器的存储单元中保存的数据的读取操作的7伏的信号；该第二内部电压可以是支持关于在闪速存储器中的存储单元的擦除操作的2 0伏的信号，等等。 For example, first internal voltage may be a 7 volt signal used on stored in the storage unit of the flash memory to support data read operation; the second internal voltage may be supported on the flash memory 20 volt signal storage unit erase operation, and the like. 将在该说明书的后面讨论不同的所产生的电压的更具体的使用。 The discussion of different voltages generated behind the use of a more specific description. 还在其它实例性实施例中，该存储器装置可以包括基板(例如半导体基板、电路板等)，在其上面存在功率管理电路(例如电压转换器电路)和闪速存储器中的一个或者二者。  In still other exemplary embodiments, the memory device may include a substrate (e.g. a semiconductor substrate, circuit board, etc. ), the presence of a power management circuitry (e.g., voltage converter circuit) and a flash memory thereon or both. 该存储器装置和/或基板可以包括相应的第一导电焊盘或功率输入引脚以接收来自存储器装置外部的第一功率源的第一电压。  The memory device and / or the substrate may comprise a respective first conductive pad or power input pin for receiving a first voltage from a first power source of the external memory device. 该存储器装置和/或基板可以包括第二导电焊盘或者功率输入引脚以接收来自存储器装置外部的第二功率源的第二电压。 The memory device and / or the substrate may include a second conductive pad or power input pin for receiving a second voltage from a second power source external storage device. 因此，替代如在常规应用中那样的仅接收单一电压，这里的实施例支持接收和使用从多个外部功率源接收的功率。 Thus, an alternative receiver is only a single voltage as in conventional applications, embodiments herein support reception and use of power received from multiple external power sources. 为了支持传送第一和第二电压到这里讨论的合适的实施例，基板(例如，半导体基板)可以包括i)传送第一电压到闪速存储器的第一导电路径，和ii)传送第二电压到功率管理电路的第二导电路径。  In order to support the first and the second voltage to the embodiments discussed herein suitable embodiments, the substrate (e.g., semiconductor substrate) can include i) a first voltage transmitting a first conductive path to the flash memory, and ii) transmission a second voltage of the second conductive path to the power management circuitry. 另外，该基板可以包括多个导电路径以传送由功率管理电路产生的电压到该闪速存储器。 Further, the substrate may comprise a plurality of conductive paths to convey the voltages generated by the power management circuitry to the flash memory. 再次注意到，如这里描述的存储器装置可以被配置成感测一个或多个输入电压的存在或幅值并且自动地选择合适的输入电压用于产生操作闪速存储器所使用的一个或多个内部电压。  Noting again, the memory device as described herein may be configured to sense a presence or magnitude or more input voltages and automatically select an appropriate input voltage for generating an operation of the flash memory is used or a plurality of internal voltages. 例如，该存储器装置可以包括检测器电路用于监控该第二电压。 For example, the memory device may include a detector circuit for monitoring the second voltage. 在该第二电压低于阈值的期间，检测器电路能够产生信号来通知或控制功率管理电路以基于第一电压而不是第二电压来获得一个或者多个内部产生的电压(例如由功率管理电路产生的在存储器装置中的内部电压)。 During the second voltage is lower than the threshold value, the detector circuitry can generate a signal notifying or controlling the power management circuit based on the first voltage rather than the second voltage to obtain one or more internally generated voltages (e.g., by the power management circuitry voltage generated in the internal memory device). 在该第二电压高于阈值的期间，该检测器电路能够产生信号来通知该功率管理电路基于该第二电压而不是第一电压来获得至少一个内部电压(例如，由功率管理电路产生的在存储器装置中的内部电压)。 During the second voltage is higher than the threshold value, the detector circuitry can generate a signal notifying the power management circuitry based on the second voltage rather than the first voltage to obtain at least one internal voltage (e.g., generated by the power management circuit voltage in the internal memory device). 因此，根据这里的实施例该功率管理电路基于多个输入电压中被选择的一个来产生内部电压。 Thus, in accordance with embodiments herein the power management circuitry generates internal voltages based on the plurality of selected input voltages. 附加的实施例通过控制寄存器或者被用于产生内部电压的特定外部电压的逻辑输入来支持电选择。  Additional embodiments support electrical selection by control register or logic input is a particular external voltage to generate an internal voltage. 这些和其它实施例将在该说明书的后面被更详细地讨论。  These and other embodiments will be discussed in more detail later in this specification. 如上讨论的，这里的技术非常适合用在存储器装置和系统中，例如那些支持使用闪存技术，电可擦除半导体存储器，非易失性存储器等等。  As discussed above, techniques herein are well suited for use in memory devices and systems, such as those supporting use of flash technology, electrically erasable semiconductor memory, a nonvolatile memory or the like. 然而，应该注意到这里的实施例不限于使用在这样的应用中并且这里讨论的技术也非常适合于其它应用。 However, it should be noted that embodiments herein are not limited to use in such applications and the techniques discussed herein are well suited for other applications. 另外，尽管可以在本公开的不同地方讨论这里的不同的特征、技术、结构等的每一个，但是通常地期望这些概念的每一个都能够彼此独立地执行或者以可行的彼此的组合来执行。  Further, although the discussion herein of different features, techniques, and structure of each, but normally desirable are each capable of independently performing one another of these concepts or at different places of the disclosure in possible combinations with each other performed. 因此，本发明的至少一些实例性实施例能够以多种不同的方式被体现和展望。 Accordingly, the present invention is to at least some example embodiments and can be embodied in many different ways prospect. 现在，更具体的，图1是说明了根据这里的实施例的存储器装置110的实例图。  Now, more specifically, FIG. 1 illustrates an example of a memory device of the embodiment of FIG herein in accordance with 110. 在本实例的情境中，存储器装置110包括输入端112(例如，输入端112-1、输入端112-2、和输入端112-3)、功率管理电路120、和存储器管理电路130。  In the context of the present example, memory device 110 includes an input terminal 112 (e.g., input 112-1, 112-2, 112-3 input terminal and an input terminal) 120, memory management circuitry and a power management circuit 130 . 功率管理电路120包括一组一个或者多个电压转换器电路122(例如，电压转换器电路例如是电压转换器电路 The power management circuit 120 includes a set of one or more voltage converter circuits 122 (e.g., voltage converter circuit is a voltage converter circuit e.g. 如非易失性半导体存储器，诸如闪速存储器)以用于存储数据。 The nonvolatile semiconductor memory, such as flash memory) for storing data. 存储器管理电路130还包括I/O逻辑138和用于访问存储器135的相关电路。  Memory management circuitry 130 also includes I / O logic 138 and related circuitry for accessing the memory 135. 在操作期间，存储器装置110的输入端112-1(例如，一个或者多个功率输入引脚、焊盘、导电路径等)接收第一电压(例如Vcc)，其用于至少给闪速存储器135提供功率。  During operation, input 112-1 (e.g., one or more power input pins, pads, conductive paths, etc.) receives a first voltage (e.g., Vcc) of the memory device 110, which at least to a flash speed memory 135 to provide power. Vcc能够被使用于给诸如I/O逻辑138的其它电路和支持访问存储器135的相关电路提供功率。 Vcc can be used to as I / O logic 138 and other circuitry associated support access memory circuit 135 to provide power. 注意到，在可选择的实施例中，存储器装置110可以包括再一个电压输入端以用于给I/O逻辑138的部分提供功率。  Note that in alternative embodiments, memory device 110 may further comprise a portion for a voltage input to the I / O logic 138 to provide power. 因此，存储器装置110不限于仅接收两个不同的输入电源电压。 Thus, memory device 110 is not limited to receiving only two different input power supply voltage. 在本实例的情境中，电压Vss表示一个或者多个接地信号，其提供对于第一电压Vcc和/或第二电压Vpp的一个或者多个对应的返回路径。  In the context of the present example, voltage Vss represents one or more ground signals, which provide a return path for the first voltage Vcc and / or one or more corresponding second voltage Vpp. 该返回路径不被认为是功率输入。 The return path is not considered to be power inputs. 另外，存储器装置110的输入端112-2(例如，一个或多个功率输入引脚、焊盘、导电路径等)接收第二电压(例如Vpp)，其被提供或者传送给功率管理电路120。 Further, the input of the memory device 110 112-2 (e.g., one or more power input pins, pads, conductive paths, etc.) receives a second voltage (e.g., Vpp), which is supplied or transmitted to the power management circuitry 120. 在一个实施例中，Vpp大于Vcc。 In one embodiment, Vpp is greater than Vcc. 因此，如图1所示，存储器装置110包括不同的输入端112以接收来自多个外部功率源的电压。  Thus, as shown, memory device 110 includes a plurality 112 to receive a voltage from an external power source different from the input terminal 1. 例如，第一功率源提供电压Vcc给存储器装置110 ;第二功率源提供Vpp给存储器装置110。 For example, the first power source voltage Vcc is provided to the memory device 110; a second power source supplies Vpp to memory device 110. 注意到，其它实施例也可以包括如上提及的附加功率输入。 It noted that other embodiments may include additional power inputs as mentioned above. V2........Vk传送给闪速存储器135。 V2 ........ Vk transferred to the flash memory 135. 如第一外部电源)。 The first external power supply). 基于Vpp，功率管理电路120获得一个或多个内部电压V1、V2........Vk，其被传送(通过存储器装置110中的导电路径126)到存储器135以便支持存储器操作。 Is obtained based on Vpp, power management circuitry 120 one or more internal voltages V1, V2 ........ Vk, which is transferred to the memory 135 (via conductive paths 110 in the memory device 126) to support memory operations. 作)，......，Vk-1 = 18伏(例如，支持编程操作)，和Vk = 20伏(例如，支持擦除操作)。 As), ......, Vk-1 = 18 volts (e.g., supporting programming operations), and Vk = 20 volts (e.g., supporting erase operations). 器135以便支持操作，例如i)编程在闪速存储器中的单元，ii)擦除在存储器135中的单元，iii)从在存储器135中的单元中读取数据。 135 to support operations such as i) programming unit in the flash memory, ii) erasing of cells in the memory 135, III) to read data from the memory unit 135 in. 再次注意到，上面的电压仅仅是实例，由功率管理电路120产生的实际电压可依据应用而改变。  It is again noted above voltages are merely examples, the actual voltage generated by the power management circuitry 120 can vary depending upon the application. 电路122，诸如，例如一个或者多个电荷泵电路。 Circuit 122, such as, for example, one or more charge pump circuits. 通常，一种类型的电荷泵是使用多级的电容器作为能量存储元件以产生较高电压或较低电压的电子电路。  Generally, one type of pump is a multi-stage capacitor as an energy storage element to the electronic circuit generating a voltage higher or lower voltage. 电荷泵使用多种形式的切换装置以控制电压与电容器的连接。 The charge pump control voltage of the capacitor forms a connection switching means. 在一个实施例中，电压转换器电路122包括Dickson类型的电荷泵，如关于图6所示和讨论的。 In one embodiment, the voltage converter circuitry 122 includes Dickson type charge pumps as shown and discussed in regard to FIG. 6. 注意到，电荷抽送动作典型地在千赫兹到兆赫兹的范围内工作，但是实际的操作频率依据应用而变化。  noted that charge pumping action typically operates in the kilohertz to megahertz range, but the actual operating frequency varies depending on the application. 而且，除了产生较高电压或较低电压之外，还应该注意到电荷泵能够被配置成将电压反置并且根据在功率管理电路120中的控制器和电路拓扑来产生很小的电压输出。 Further, in addition to generating a higher voltage or a lower voltage, the charge pump should also be noted that the voltages can be configured to be inverted and generates a small voltage output according to the controller and circuit topology in power management circuitry 120. 和输出电压之间的差比较小的情况下该电荷泵典型地在产生较高电压时更有效。 And a case where a relatively small difference between the output voltage of the charge pump is typically at a higher voltage is generated more efficiently. 换句话说，如上讨论的，对于将3.3伏的输入转换成20伏的输出的电荷泵的转换效率低于对于将5伏的输入转换成20伏的输出的电荷泵的转换效率。 In other words, as discussed above, to convert an input of 3.3 volts to 20 volts the output of the charge pump for converting the conversion efficiency is lower than 5 volt input to 20 volts output conversion efficiency of the charge pump. 因此，如这里描述的，基于较高输入电压Vpp (而不是Vcc)产生内部电压V1、V2........Vk提高了功率管理电路120的功率转换效率。 Thus, as described herein, generating internal voltages V1 based on the higher input voltage Vpp (rather than Vcc), V2 ........ Vk increases the power conversion efficiency of the power management circuit 120. 个级。 Stages. 例如，为了将3.3伏的输入转换成20伏可能要求24级的电荷泵，而将5伏的输入转换成20伏可能仅仅要求10级的电荷泵。 For example, in order to convert the 3.3 volt input to 20 volts may require a charge pump 24, and converted into a 5 volt input 20 may only require 10 volts charge pump. 因此，这里的实施例减小了产生内部电压V1、V2........Vk所使用的对应的电压转换器电路的尺寸和复杂性。 Thus, embodiments herein reduce the generation of an internal voltage V1, the size and complexity of corresponding voltage converter circuit V2 ........ Vk used. 为了执行这里描述的实施例，存储器装置110可以包括基板(例如半导体基板、印刷电路板、柔性电路板等)，在其上有功率管理电路120和闪速存储器135中的一个或这两者。  In order to perform the embodiments described herein, memory device 110 may include a substrate (e.g. a semiconductor substrate, a printed circuit board, a flexible circuit board or the like), a power management circuit 120 and a flash memory 135 or on which this two. 存储器装置110和/或基板可以包括用于接收来自存储器装置外部的第一功率源的第一电压的相应的导电焊盘或功率输入引脚和用于接收来自存储器装置外部的第二功率源的第二电压的第二导电焊盘或功率输入引脚。 The memory device 110 and / or substrate may comprise a first means for receiving a first power source voltage from the external memory device of a respective conductive pad or power input pin for receiving a second memory device from the external power source a second conductive pad or power input pin of the second voltage. 作为实例性的电压范围，根据与存储器135相关联的功率要求，输入端112-1能够支持接收电压Vcc，例如在1.5和3.5伏之间的电压。  As an example of the voltage range, associated with the memory 135 according to power requirements, input 112-1 can support receiving voltage Vcc, for example, a voltage between 1.5 and 3.5 volts. 输入端112-2能够被配置成支持接收较高输入电压Vpp (例如，Vpp能够大于Vcc,如前面讨论的那样)。 Input 112-2 can be configured to support receiving higher input voltages Vpp (e.g., Vpp can be greater than Vcc, as previously discussed). 再次注意到，上面讨论的实例性的电压值和范围仅仅是出于说明的目的，输入电压(例如Vpp和Vcc)的实际值能够依据应用而改变。  It is again noted exemplary voltage values ​​and ranges discussed above purposes only, the input voltage instructions (e.g., Vpp and Vcc) of the actual value can be changed depending on the application. 基于上述讨论，这里的实施例包括存储器装置110，其被配置成克服了如上面讨论的不足和/或本领域中已知的其它不足。  Based on the above discussion, embodiments herein include a memory device 110, which is configured to overcome the deficiencies and / or other deficiencies known in the art as discussed above. 例如，根据这里的实施例，存储器装置110包括存储器135以用于保存数据。 For example, according to embodiments herein, memory device 110 includes a memory 135 for storing data. 替代使用在输入端112-1上接收的相同输入电压(例如Vcc)给存储器135和电压转换器电路122两者提供功率，存储器装置110包括用于接收电压Vpp的附加输入端112-2。 Instead of using the input terminal 112-1 receives the same input voltage (e.g., Vcc) providing power to both the memory circuits 122 and the voltage converter 135, a memory device 110 includes additional input terminal for receiving a voltage Vpp 112-2. 器电路(例如，电荷泵电路)的尺寸和复杂性。 The size and complexity of the circuit (e.g., a charge pump circuit). 行。 Row. 然而，大多数的应用将受益于用于向功率管理电路120提供功率的另一电压，例如Vpp。 However, most applications will benefit from another voltage providing power to a power management circuit 120 for, e.g. Vpp. 图2是根据这里的实施例的包括多个功率输入端的存储器装置110的实例图。  FIG. FIG. 2 is an example of a plurality of power input comprises a memory device 110 according to embodiments herein. 通常，在图2中的存储器装置110支持与上面关于图1的讨论相同的操作。 Typically, the memory device 110 above the support and in FIG. 2 in the same operation with respect to the discussion of FIG. 然而，在图2中的存储器装置110说明了能够使用Vpp作为功率管理电路120的第一功率源和Vcc是对于存储器核(例如，存储器135)和对应的控制和I/O逻辑138的第一功率源。 However, the memory device 110 in FIG. 2 illustrates a first possible to use Vpp as the power source Vcc and the power management circuit 120 for the memory core (e.g., memory 135) and the corresponding control and I / O logic 138, a first power source. 然而，附加的，如图2所示，Vcc可以被用在内部功率管理电路120的一部分中以支持例如参考发生器、主振荡器、和时钟驱动器等的功能。 However, in addition, as shown in FIG, Vcc may be used in a portion of the internal power management circuitry 120 to support, for example, reference generator, master oscillator, clock driver, etc. and the functions of two. 还注意到Vpp可以被用在存储器135的一部分中以执行例如在行解码器和行预解码器中的本地电荷泵的功能。 Also noted that Vpp may be used in a portion of the memory 135 to perform, for example, a local charge pump in row decoders and row pre-decoder functions. 不可获得时产生内部电压V1、V2........Vk的备份。 When generating an internal voltage V1 is not available, V2 ........ Vk backup. 在一个实施例中，如所示的实例性泵能够被设计成基于较低电压操作。  In one embodiment, as illustrated in the exemplary pump it can be designed to operate based on lower voltages. 然而，如果较高电压被用于操作该电压转换器电路122(例如电荷泵电路)，该泵将更快且更早地关闭。 However, if the high voltage is the voltage converter circuitry 122 (e.g., a charge pump circuit) for operating the pump faster and earlier closed. 检测器电路310能够确定是自动地选择输入电压Vcc还是输入电压Vpp的一种方法是比较在输入端112-2处的电压与阈值参考值。  The detector circuit 310 can determine whether to automatically select the input voltage Vcc or input voltage Vpp A method is compared with a threshold value of the reference voltage at the input terminal 112-2. 如果在输入端112-2处的电压大于阈值，该检测器电路310控制开关305以传送在该输入端112-2处的电压到电压转换器电路122。 If greater than the threshold voltage at the input 112-2, the detector circuit 310 controls the switch 305 to transmit the voltage at the input 112-2 to the voltage converter circuit 122. 如果在输入端112-2处的电压小于阈值，则检测器电路310控制开关305以传送在输入端112-1处的电压到电压转换器电路122。 If less than the threshold voltage at the input 112-2, the detector circuitry 310 controls switch 305 to transfer to the voltage converter circuit 122 in the voltage at the input terminal 112-1. 态来产生内部电压V1、V2、......、Vk。 State to generate an internal voltage V1, V2, ......, Vk. 在一个实施例中，如果输入电压相等，则存储器装置110能够以如上所讨论的和如图2所示的那样操作。  In one embodiment, if the input voltage are equal, then the memory device 110 can be as discussed above and as shown in the operation as shown in FIG. 2. 基于如上讨论的不同操作模式，能够通过使用例如比较在Vpp引脚上的电平和Vcc电源电压的比较器来检测Vpp的电压电平或状态，从而自动引发在单一电源模式(例如Vcc被使用于给功率管理电路120和存储器管理电路提供功率)和多电源模式(例如使用如图1所示的Vcc和Vpp)之间的模式切换。  Based on the different operational modes as discussed above, for example, can be Vcc level and the comparator comparison level supply voltage Vpp pin on the detected voltage Vpp level or state by using a single power source to automatically trigger mode (e.g. Vcc to be used in power management circuitry 120 and memory management circuitry to provide power) and a multi-power mode (e.g., using Vcc as shown in FIG. 1 and Vpp) between the switching mode. 因此，如果使用者已将Vpp引脚接地(OV)，则存储器将使用Vcc电源以便给内部高电压泵供电。 Thus, if the user has Vpp pin to ground (OV), then the memory will use the Vcc supply to supply the internal high voltage pumps. 如果使用者已将Vpp连接到适合的电压(5-12V)，则该存储器能够使用Vpp电源给泵提供功率以用于更高效率的操作。 If the user has connected Vpp to a suitable voltage (5-12V), the memory can be used to provide power to the power supply Vpp pumps for higher efficiency operation. 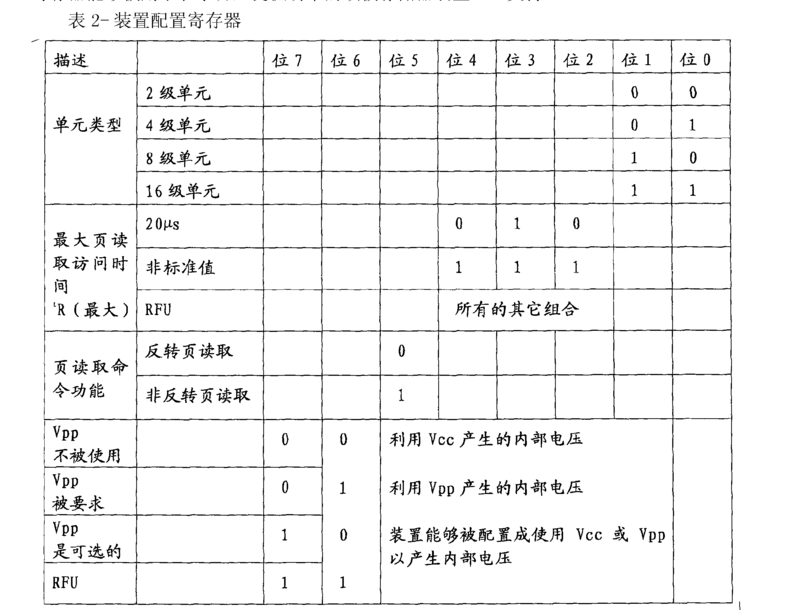 的表1中的装置控制寄存器的位O。 Bit control register means in Table 1 O. 为了选择Vpp作为用于产生内部电压V1、V2........Vk的源，控制器将逻辑I写入到在下面的表1中的装置控制寄存器的位O。 In order to select Vpp as for generating an internal voltage V1, V2 ........ Vk source, the controller logic I is written to the control register bit device in the following Table 1 O. 根据一些实例性实施例，在闪速存储器装置135中的读装置信息寄存器(如在下面的表2中的那样)可以基于位6和7提供关于存储器装置110的可能配置的信息。  According to some exemplary embodiments, the read information register means (as in Table 2 as below) in the flash memory device 135 may provide information about the memory device 110 may be configured based on bits 6 and 7. 例如，当位6和7是逻辑“0”时，这表示给定的存储器装置110使用输入电压Vcc以产生内部电压。 For example, when the bit 6 and 7 are logic "0", this indicates that the given memory device 110 uses input voltage Vcc to generate an internal voltage. 当位6是“0”并且位7是“I”时，这表示给定的存储器装置110使用输入电压Vpp以产生内部电压。 When bit 6 is "0" and bit 7 is "I", this indicates that the given memory device 110 uses input voltage Vpp to generate the internal voltages. 最后，当位6是“I”并且位7是“0”时，这表示给定的存储器装置110能够由控制器配置以使用输入电压Vpp或者输入电压Vcc来产生内部电压。 Finally, when the bit 6 is "I" and bit 7 is "0", this indicates that the given memory device 110 can be configured by a controller to use input voltage Vpp or input voltage Vcc to generate the internal voltage. 因此，该装置配置寄存器能够被用于表示哪些提供功率的项被存储器装置110支持。 Therefore, the device configuration register which can be used to provide power to the memory device 110 to support items are represented. 图4是说明根据这里的实施例的与存储器装置110相关联的样品的组件外形尺寸的实例图。  FIG. 4 is a diagram illustrating a memory device 110 in accordance with the sample components associated with the dimensions of the example of embodiment herein FIG. 为了清楚起见，点的垂直序列表示从引脚到存储器装置410的连接。 For clarity, the vertical sequence indicates the point of connection to the pin 410 from the memory device. 如所示，组件410能够被具体化为例如48引脚的TSOPl类型的组件(12毫米X 20毫米)。  As shown, the assembly 410 can be embodied as e.g. TSOPl pin assembly 48 of the type (12 mm X 20 mm). 组件410的引脚I专用于接收传送到存储器装置110的输入端112-2的输入电压Vpp。 I pin assembly 410 dedicated to receiving means to the input of the memory 110 of the input voltage Vpp 112-2. 组件410的引脚12专用于接收传送到存储器装置110的输入端112-1的电压Vcc。 12 dedicated pin assembly 410 to the input of the memory device 110 to receiving voltage Vcc 112-1. 引脚13将被连接到对应的地电压(例如，输入端112-3)。 Pin 13 is connected to a corresponding ground voltage (e.g., input 112-3). 引脚28和44是用于各自给I/O逻辑138的一部分提供功率的附加输入端的例子，如前讨论的那样。  Pins 28 and 44 are examples of additional input to provide power to each part of I / O logic 138 is used, as discussed earlier. 引脚30和43将被连接到与电压Vccq相关联的地。 Pins 30 and 43 are connected to the voltage associated with the ground Vccq. 与图4中的组件410相关联的附加细节能够在序列号60/902，003的美国临时专利申请中找到。  Additional details can be found 410 and associated components of Figure 4 in U.S. Provisional Patent Application Serial No. 60 / 902,003 in. 作为上面的实施例的替换,注意到，能够从外部源接收电压Vpp和电压Vcc而不必通过在基板505上的电源装置来转换。  As an alternative embodiment of the above embodiment, it is noted, is capable of receiving voltage Vcc and voltage Vpp from an external source need not necessarily be converted by the power supply device 505 on the substrate. 因此，取决于不同电源电压Vcc和Vpp的有效性，功率转换器550是可任选的。 Thus, depending on the effectiveness of different power supply voltages Vcc and Vpp, the power converter 550 is optional. 如前讨论的，存储器系统500中的一个或多个存储器装置的每一个可以包括由电压Vcc来提供功率的相应的闪速存储器135、和相应的功率管理电路120以用于接收电压Vpp并将其转换成由相应的闪速存储器使用的至少一个电压来执行存储器操作，以便管理保存在对应的存储器装置中的数据。  As each of the one of the memory system 500 discussed previously, or may include a plurality of memory devices to provide a power voltage Vcc from the respective flash memory 135, and a respective power management circuitry 120 for receiving the voltage Vpp and converts it into the at least one voltage used by the respective flash memory to perform memory operations to manage data stored in a corresponding memory device. 存储器系统500可以包括基板505 (例如电路基板、印刷电路板、柔性带、在单个组件中的多个芯片等)，在该基板上存在一组存储器装置。  Memory system 500 may include a substrate 505 (e.g. a circuit board, a printed circuit board, a flexible belt, a plurality of chips in a single package, etc. ), a set of memory devices present on the substrate. 例如功率转换器550和访问控制器560的可选电路也能够存在于基板505上或者存在于关于基板505的一个或多个远程位置(例如在母板、控制器等上面)。 For example, the power converter 550 and access controller 560 can be optionally present on the circuit board 505 or present in one or more remote locations on the substrate 505 (e.g., above a motherboard, controller, etc.). 为了将电压Vcc和Vpp传送到存储器装置，该基板可以包括导电路径510。  In order to transfer the voltage Vcc and Vpp to the memory device, the substrate may include a conductive path 510. 如所示，导电路径510-1将电压Vcc传送到在基板505上的存储器装置。 As shown, conductive path 510-1 to the voltage Vcc to memory device 505 on the substrate. 导电路径510-2将电压Vpp传送给在基板505上的存储器装置。 A conductive path 510-2 to voltage Vpp to the memory device 505 on the substrate. 根据如前面讨论的实施例，在基板505上的每一个存储器装置可以包括对应的第一功率输入引脚以用于将电压Vcc递送到相应的存储器装置的闪速存储器。  According to the embodiment, as previously discussed, each memory device on substrate 505 may include a corresponding first power input pin to deliver voltage Vcc to the flash memory corresponding to the memory device. 另外，在基板505上的每一个存储器装置可以包括对应的第二功率输入引脚以用于将电压Vpp递送到相应的存储器装置的功率管理电路。 Further, each of the memory devices on the substrate 505 may include a corresponding second power input pin to deliver voltage Vpp to the power management circuitry to the respective memory devices. 如前讨论的，由相应的功率管理电路产生的一个或多个内部电压能够起如下功能，例如:i)编程在相应闪速存储器中的单元，ii)擦除在相应闪速存储器中的单元，iii)读取来自在相应闪速存储器中的单元的数据。  As previously discussed, the one or more internal voltages generated by the respective power management circuit could play a function, for example: i) a respective programming unit in the flash memory, ii) erasing the flash memory in the respective data unit cells, iii) read from the respective flash memory. 存储器系统500能够被用在多种不同类型的消费者和商业应用中。  The memory system 500 can be used in many different types of consumer and commercial applications. 例如，在一个实施例中，存储器系统500是闪存盘(thumb drive)装置，例如插入到计算机的USB端口的存储棒。 For example, in one embodiment, system memory 500 is a flash disk (thumb drive) device, such as a memory stick is inserted into the computer's USB port. 在这样的例子中，USB端口可以提供例如Vpp的电压，其被本地下变换成Vcc。 In such an example, USB ports may be provided, for example, a voltage Vpp, which is converted into the local Vcc. 在闪存盘装置中的Vpp和本地产生的Vcc被施加到在该闪存盘装置(例如所谓的存储棒)中的对应的一个或多个存储器装置以执行如这里描述的功能。 Vcc Vpp and locally generated flash disk apparatus is applied to a corresponding one of the flash disk device (e.g., a so-called memory stick) or more memory devices to perform the functions as described herein. 根据另一个实施例，存储器系统500可以是可拆卸地连接到母板的单列或双列直插存储器板。  500 may be removably connected to the motherboard in accordance with another embodiment, the memory system according to single or dual inline memory board. 根据另一个实施例，存储器系统500是与计算机系统相关联的固态内部存储器驱动器。  According to another embodiment, the memory system 500 is a solid state internal memory drive associated with a computer system. 根据另一个实施例，存储器系统500是计算机系统可访问的外部驱动器。  According to another embodiment, the memory system 500 is an external drive accessible by a computer system. 因此，存储器系统500能够以取决于应用的多个不同形式因素被配置。 Thus, the memory system 500 can be configured in many different form factors depending on the application. 图6是说明根据这里的实施例的电压转换器电路122的实例图，其将例如Vpp或  FIG. 6 is a diagram illustrating an example of the voltage converter circuit 122 of FIG embodiments herein, or which Vpp e.g. 率，CLK和CLK#能够是如所不的Vcc电平/[目号，或者可选择的Vpp电平彳目号。 Rate, the CLK and CLK # can be Vcc level as not to / [log number, or alternatively Vpp level of the left foot mesh number. 基于如所不的时钟信号和输入电压的应用，电压转换器电路122产生内部电压VI。 122 generates an internal voltage VI as not based on a clock signal applied to the input voltage, the voltage converter circuit. 如前面讨论的，功率管理电路120可以包括多个其它电压转换器电路122 (类似于图6中所示的)以产生其它内部电压V2、......、Vk。 As previously discussed, the power management circuitry 120 may include multiple other voltage converter circuitry 122 (similar to that shown in FIG. 6) to produce other internal voltages V2, ......, Vk. 更具体的，图6包括实例性的N级的乘法器(例如多个电压转换器之一)和与多个电压转换器之一相关联的对应操作的典型电压波形的说明。  More specifically, examples of FIG. 6 includes N-stage multiplier (e.g., one of multiple voltage converters) illustrates a typical voltage waveform corresponding to the operation and one of the plurality of voltage converters associated. 再次注意到，根据这里的实施例，电压转换器电路122能够被使用在功率管理电路120中。 Again noted that, according to an embodiment herein, the voltage converter circuit 122 can be used in the power management circuit 120. 如图6所示，两个时钟(即CLK和CLK#)是反相位的且具有幅值Vcc，并且电容耦合到在开关链路中的对应的栅极。 As shown in  FIG 6, two clocks (i.e., CLK and CLK #) are in phase opposition and having a magnitude Vcc, and a gate capacitively coupled to a corresponding switch link. 在本实例的情境中，电压转换器电路122 (例如乘法器)以与组桶式延迟线相类似的方式操作，然而，在开关链路中的开关之间的节点处的电压在每个抽送周期之后不复位，以使得平均节点电压电势(例如在开关链路中的一个开关和下一个开关之间的节点的电压)从开关链路的输入端到输出端逐步增加以产生电压VI。 In the context of the present example, the voltage converter circuit 122 (e.g., multiplier) with a bucket brigade delay line in a similar manner, however, the voltage at the node between the switches in the switch link of each pumping after the reset period does not, so that the average node voltage potentials (e.g., a voltage of a node between the switch and the lower switch link a switch) from the input end to the output terminal of the switch link progressively increases to produce a voltage VI. 该操作在原理上类似于在MOS (金属氧化物半导体)集成电路中经常使用以便增大电压的公知的“自举”技术。 This operation is in principle similar to MOS (metal oxide semiconductor) integrated circuits are often used in order to increase the voltage of the well-known "bootstrapping" technique. 再次注意到如图6中示出的电压转换器电路122仅仅以举例方式被示出并且其它转换器电路或线路能够被使用在功率管理电路120中以将输入电压转换成输出电压。  FIG. 6 again noted that the voltage converter circuit 122 illustrated is only shown by way of example and that other converters circuits or lines can be used in the power management circuitry 120 to convert an input voltage into an output voltage. 图7是说明根据这里的实施例的功率管理电路120和相关联电路的实例图。  FIG. 7 is a diagram illustrating an example of a power management circuit of FIG embodiment herein 120 and associated circuitry. 如所示，功率管理电路120包括电源控制器702以用于启动不同电压转换器电路的操作。 Illustrated, 120 includes a power controller 702 for starting different operations of the voltage converter circuit such as a power management circuit. 基于来自电源控制器702的输入,参考发生器710对于每一个转换器122产生不同的参考电压。 Based on input from power supply controller 702, reference generator 710 for every converter 122 generates different reference voltages. 主振荡器产生时钟信号。 Master oscillator generates a clock signal. 每一个调节器715(例如调节器715-1，调节器715_2，调节器715_3，调节器715-4，调节器715-5)依据由给定的电压转换器产生的对应电压来接收对应的参考电压。  Each actuator 715 (e.g., regulator 715-1, regulator 715_2, 715_3 regulator, regulator 715-4, regulator 715-5) receives a corresponding voltage generated according to a given voltage by the converter corresponding to the reference voltage. 例如，调节器715-1接收电压参考Verase_ref，调节器715-2接收电压参考Vprogram_ref，等等。 For example, regulator 715-1 receives voltage reference Verase_ref, regulator 715-2 receives voltage reference Vprogram_ref, and the like. 电压调节器715给对应的驱动器720提供对应产生的电压是否在调节内的指示。 Whether the voltage regulator 715 to the corresponding driver 720 provides a corresponding indication in the regulation of a voltage generated therein. 取决于来自振荡器705的主时钟信号和从对应的调节器715接收到的相应输入控制，驱动器720的每一个(例如驱动器720-1，调节器720-2，调节器720-3，调节器720-4，调节器720-5)输出一个或多个控制信号到对应的电荷泵单元730。  dependent on the main clock signal from the oscillator 705 and the corresponding input 715 received from the corresponding regulator to control each drive (e.g. drive 720-1720, the regulator 720-2, regulator 720-3 , regulator 720-4, regulator 720-5) outputs one or more control signals to corresponding charge pump unit 730. 电荷泵单元730(例如电荷泵730-1，电荷泵730-2，电荷泵730-3，电荷泵730-4，和电荷泵730-5)接着产生被用于支持不同存储器操作的相应内部电压Vl、V2........V5。 Charge pump unit 730 (e.g., charge pump 730-1, charge pump 730-2, charge pump 730-3, charge pump 730-4, charge pump 730-5) then generates respective internal voltages are used to support different memory operations Vl, V2 ........ V5. 后的图8-11中的实例性NAND闪速存储器实施例中。 After 8-11 an example NAND flash memory embodiment. 如本领域的技术人员将了解的，可以通过单元技术、装置技术和过程技术来改变如上提及的高电压电平。  As those skilled in the art will appreciate, it is possible to change the high voltage level as mentioned above by means of cell technology, device technology, and process technology. 图8是说明根据这里的实施例的关于存储器单元的擦除操作的实例图。  FIG. 8 is an explanatory view of an example of erased memory cells on embodiments herein operation. 在NAND闪速存储器实施例中，通过FN隧穿来管理在存储器135中的单元的擦除和编程。  NAND flash memory in the embodiment, to erase and program management unit in a memory 135 by FN tunneling. 在擦除操作期间，存储器135的对应单元810的顶聚(top poly)815(即顶栅)被偏置到Vss (地)，同时单元810的衬底830被偏置到由功率管理电路120产生的擦除电压Vers (例如20伏)。 During an erase operation, the memory 135 corresponding to the top unit 810 poly (top poly) 815 (i.e. top gate) is biased to Vss (ground), while the substrate 830 is biased to unit 810 by the power management circuitry 120 generated erase voltage Vers (e.g. 20 volts). 单元810的源和漏极被浮置(由于从P-衬底830到n+源极/漏极的结正向偏置，源极和漏极自动被偏置到Vers (例如Verase))。 Source and drain unit 810 is floating (because the source / drain junction is forward biased from the P- substrate 830 to n + source, the source and drain are automatically biased to Vers (e.g. Verase)). 通过该擦除偏置条件,在浮置的聚(floating poly)820(即浮置栅)中的捕获电子(电荷)经由隧道氧化物825被均一地发送到衬底830，如所示。 By this erase bias condition, in the floating poly (floating poly) 820 (i.e. floating gate) capture electrons (charge) is uniformly transmitted via the tunnel oxide 825 to the substrate 830, as shown. 被擦除单元的单元的Vth(例如电压阈值)变为负，如图8的图表850中所示。  Vth erased cell units (e.g., voltage threshold) becomes negative, as shown in the graph 8508. 换句话说，该被擦除的单元是导通状态的晶体管(即通常利用OV的栅极偏压Vg被导通)。 In other words, the erased cell is an ON state of the transistor (i.e., typically utilize a gate bias Vg OV is turned on). 图9是说明根据这里的实施例的单元编程操作的实例图。  FIG. 9 is an explanatory view of an example of embodiment herein cell programming operation. 如所示，在编程操作期间，存储器135的实例性单元910的顶聚(toppoly)915( SP顶栅)被偏置到编程电压Vpgm，而单元910的衬底930、源极和漏极被偏置到Vss (地)。  As shown, during a program operation, the memory unit 135 is an example of a top poly 910 (toppoly) 915 (SP top gate) is biased to the program voltage Vpgm is, the unit of the substrate 930,910, and a source the drain is biased to Vss (ground). 通过该编程偏置条件，在衬底930中的电子(电荷)经由隧道氧化物925被均一地注入浮置的聚(floating poly)920(即浮置栅)。 By this program bias condition, electrons in the substrate 930 (charge) 925 is uniformly injected through the tunnel oxide of the floating poly (floating poly) 920 (i.e. floating gate). 被编程的单元的电压阈值变为正，如图9的图表950中所示。 Voltage threshold is programmed cell becomes positive as shown in graph 9509 of FIG. 换句话说，该被编程的单元是截止状态晶体管(即通常利用OV的栅极偏压Vg被关断)。 In other words, the cell is programmed OFF state of the transistor (i.e., typically utilize a gate bias Vg of OV is turned off). 图10是说明根据这里的实施例的被擦除的单元的读取的实例图。  FIG. 10 is an explanatory view of the example of the read cell is erased embodiments herein. 为了读取在存储器135中的单元的单元数据，被选择的单元(例如，单元1010)的对应的栅极和源极被偏置到0V。  In order to read the memory unit 135 of the cell data, means (e.g., cell 1010) are selected corresponding to the source and gate electrode is biased to 0V. 如果单元1010诸如被擦除的单元如图10中所示，该被擦除的单元810具有负阈值电压(如图表1050中所示)且因此在该给定偏置条件下存在从漏极到源极的单元电流(Icell)。  If the cell 1010 such as the erased cell as shown in FIG. 10, the erased cell 810 has a negative threshold voltage (as shown in graph 1050) and thus present at a given bias condition from the a drain cell current (Icell) to the source. 图11是说明根据这里的实施例的被编程的单元的读取的实例图。  FIG. 11 is a view of illustrating an example embodiment of the programmed reading of the unit herein. 如上讨论的那样为了读取在存储器135中的单元的单元数据，被选择的单元(例如单元1110)的对应的栅极和源极被偏置到0V。  In order to read the memory unit 135 of data unit as discussed above, the unit (e.g., unit 1110) is selected corresponding to the source and gate electrode is biased to 0V. 如果单元1110被编程，如图11中所示，该被编程的单元1110具有正阈值电压(如图表1150中所示)和在该给定偏置条件下不存在从漏极到源极的单元电流。  If the cell 1110 is programmed, as shown in FIG. 11, the programmed cell 1110 has a positive threshold voltage value (e.g., the graph shown in 1150) and from drain to source does not exist at the given bias condition the cell current electrode. 连接到每一个位线的读出放大器读出并锁存单元数据；诸如在图10中的单元1010的被擦除的单元(导通单元)被读出为逻辑“I”和诸如在图11中的单元1110的被编程的单元(关断单元)被读出为逻辑“O”。 Is connected to each bit line sense amplifier and readout data latch unit; Fig. 10 in such cells are erased in units of 1010 (on-cell) is read out as a logic "I" and 11 as in FIG. the cell is programmed unit 1110 (off-cell) is read out as logic "O". 图12是说明根据这里的实施例的在与存储器装置110相关联的读取页操作期间的偏置条件和使用由功率管理电路120产生的内部电压(例如Vread)的NAND单元串的实例图。  FIG. 12 is a diagram illustrating the bias conditions according to embodiments herein the page during a read operation of the memory device 110 and associated with the use of the internal voltage generated by the power management circuit 120 (e.g. Vread) NAND cell string examples FIG. 在存储器135中被选择的字线(例如字线27)被设置为0V，而未选择的字线(例如字线0-26和28-31)、SSL和GSL被偏置到电压Vread(例如7伏)。  memory 135 in the selected word line (e.g. word line 27) is set to 0V, the word line (e.g. word lines 0-26 and 28-31) unselected, SSL, and GSL are biased to voltage Vread (e.g. 7 volts). Vread由功率管理电路120产生并且足够高以致使未选择的单元晶体管(例如在字线0-26和28-31上的那些晶体管)导通，而与它们的编程状态(即单元Vth)无关。 Vread is generated by power management circuitry 120 and is sufficiently high to cause the unselected cell transistors (e.g., those transistors in the word line 0-26 and 28-31) conductive regardless of their programmed state (i.e. cell Vth). 该公共源极线(CSL)被设置接地。 The common source line (CSL) is a ground. 在应用读取偏置条件的情况中，所选择的单元的电压阈值(例如Vth)确定单元电流Icell。 In the case of applying the read bias conditions, the voltage threshold (e.g., Vth) of the selected cell determines the cell current Icell. 该单元电流Icell由在页缓冲器中的位线读出放大器来读出。 The cell current Icell in the page buffer by the bit line sense amplifier is read out. 因此，位线读出放大器能够检测单元1210的状态。 Thus, the state of bit line sense amplifier unit 1210 can be detected. 图13是说明根据这里的实施例的块擦除操作的实例图。  FIG. 13 is a diagram illustrating an erase operation according to the example of FIG embodiment herein block. 在存储器135中的闪速存储器单元必须在编程之前被擦除。  flash memory cells in memory 135 must be erased prior to programming. 根据一个实施例，是以块为基础而不是以逐个单元为基础来执行擦除操作。 According to one embodiment, it is a block basis rather than by-unit basis to perform an erase operation. 为了执行在图13中所示的存储器135的单元的块擦除操作，袋型的P-阱(PP-阱)衬底1325被偏置到由功率管理电路120产生的擦除电压Vers，而在所选择的块中的位线(B/Ls)和公共源极线(CSL)被设置到浮置状态。  In order to perform a block erase operation of the memory cell shown in FIG. 13 135, P- well-bag type (the PP-well) substrate 1325 is biased to an erase voltage generated by the power management circuit 120 vers, the selected block while the bit lines (B / Ls) and common source line (CSL) is set to the floating state. 在上述状态的同时，在被选择的块中的所有字线被偏置到0V，而通过在它们(例如SSL和GSL)与衬底1325之间发生的电容去耦合，串选择线(SSL)和地选择线(GSL)被浮置和提升到擦除电压Vers。 While the state described above, all the word lines in the selected block are biased to 0V is, the decoupling capacitor through them (e.g., SSL and GSL) and the substrate 1325 between the string selection line (SSL) and a ground selection line (the GSL) are floated and raised to the erase voltage Vers. 通过该技术，在所选择的块中的整个组的单元能够通过FN隧穿被擦除。 By this technique, the entire group of cell in the selected block can be erased by FN tunneling through. 图14是说明根据这里的实施例的页编程操作的实例图。  FIG. 14 is an explanatory view of an example of embodiment herein page programming operation. 注意到在所选择的块中的所选择的页必须在页编程之前被擦除并且该被擦除的单元被读取为逻辑“ I”。 Noting must be erased and the erased prior to programming page in the page in the selected block of the selected cell is read as a logic "I". 由功率管理电路120产生的下面的电压被用于执行如下讨论的页编程操作:Vpgm, Vpass和Vpi。  The following voltage generated by power management circuitry 120 is used to perform a page program operation as discussed below: Vpgm, Vpass, and Vpi. 用于编程的Vpgm(例如在本实例的情境中的〜18V)被设置到足够高的编程电压以使用在所选择的单元上的OV的漏极电压引起FN隧穿。 Vpgm is (e.g. ~18V in the context of the present example) for programming is set to a sufficiently high program voltage to the drain voltage of OV is used in the selected cell causes the FN tunneling. 用于“通过” Vpi的Vpass (例如在本实例的情境中的〜10V)被设置到足够高的通过电压以致使在所选择的串中的未选择的单元晶体管导通而与它们的编程状态(即单元Vth)无关。 Is provided for by a sufficiently high voltage to cause the transistor in the cell string in the selected and unselected to their programmed state "by" Vpi of Vpass (e.g. ~10V in the context of the present example) (i.e., units Vth) independent. 同时，Vpass应该足够低以使得不会在未选择的单元上引起FN隧穿。 Meanwhile, Vpass should be sufficiently low so as not to cause FN tunneling on unselected cells to wear. 用于禁止编程的Vpi (例如，在本实例的情境中的〜8V)被设置到足够高的编程禁止电压以阻止在所选择的单元上的FN隧穿。 Vpi (e.g., ~8V in the context of the present example) is provided for inhibiting programmed to a sufficiently high program inhibit voltage to prevent FN tunneling on the selected cell to wear. Vpi典型地高于电源电压Vcc并且低于Vpass。 Typically Vpi is higher than the power supply voltage Vcc and lower than Vpass. 在逻辑“0”编程的情况中，所选择的位线被设置到OV并且所选择的单元的沟道接地。  In the case of a logic "0" programming in the selected bit line is set to OV and the channel of the selected ground cell. 所选择的单元的栅极被偏置到第一电压Vpgm。 The gate of the selected cell is biased to the first voltage Vpgm. 因此，通过从漏极注入电子(FN隧穿)到浮置栅来编程所选择的单元。 Thus, by injecting electrons (FN tunneling) is programmed into the floating gate from the drain of the selected cell. 在逻辑“I”编程的情况中，在编程之前的被擦除的单元必须保持单元状态(即被擦除的单元的阈值电压Vth)。  In the case of a logic "I" in the program, before the programmed cells are erased must remain cell state (i.e. erased threshold voltage Vth of the unit). 换句话说，单元编程被阻止。 In other words, cell programming is prevented. 为了阻止单元编程，所选择的单元位线被设置到Vpi并且该Vpi电平经由未选择的单元被传递到所选择的单元的漏极。 To prevent cell programming, the selected cell bitline is set to Vpi and the Vpi level via the unselected cell is transferred to the drain of the selected cell. 在所选择的单元上的电压差(Vpgm-Vpi)阻止从漏极到浮置栅的FN隧穿。 In the selected cell voltage difference (Vpgm-Vpi) to prevent wear from the drain into the floating gate of FN tunneling. 在前面的实例中，高编程禁止电压Vpi直接经由位线被提供给NAND串沟道。  In the foregoing example, a high program inhibit voltage Vpi is directly supplied to the NAND string channel through the bit lines. 在最坏的情况中，对应于全部所选择的页的所有位线被设置到Vpi (即在所选择的页上的所有单元被编程为逻辑'I'的情况)，这产生下面的问题:在编程操作期间由内部高电压发生器来提供Vpi并且要求大容量的电荷泵来提供Vpi至高容量位线。 In the worst case, corresponding to all the selected pages of all the bit lines are set to Vpi (i.e., all cells on the selected page are programmed to the logic 'I' case), which produces the following problems: during a programming operation Vpi is provided by an internal high voltage generator and a large capacity charge pump is required to provide a high capacity Vpi bit line. 这导致功率消耗和芯片尺寸的急剧增加。 This led to a sharp increase in power consumption and chip size. 连接到位线的页缓冲器必须被提供有高电压晶体管以便提供Vpi。 A bit line connected to the page buffer must be provided with high voltage transistors in order to provide Vpi. 高电压晶体管大于常规电压(即Vcc)晶体管，这加大了页缓冲器尺寸(和由此导致的芯片尺寸)。 Conventional high voltage transistor is larger than a voltage (i.e. Vcc) transistors, which increase the page buffer size (and thereby resulting in chip size). 由高电压位线隔离要求来担负存储器的进一步按比例缩小。 Isolated from the high voltage line memory requirements bear further scaled down. 由于由具有受限电流源的内置电压发生器来给高容量位线充电至Vpi，所以编程速度较慢。 Since the high capacity charged to the bit line to Vpi by a built-in voltage generator having a limited current source, the slower the programming. 图15是说明根据这里的实施例的页编程偏置条件的实例图。  FIG. 15 is a view of an example of the page program bias conditions embodiments described herein. 为了解决在图14中描述的问题，可使用在图15中示出的自升压编程禁止方案。  In order to solve the problem described in FIG. 14 may be used in the self-boosting program inhibit scheme shown in FIG. 15. 在SSL晶体管导通并且GSL晶体管关断的情况中，要被编程的单元的位线电压被设置到0V，同时要被禁止编程的单元的位线电压被设置到Vcc。  In the case of SSL transistors turned on and the GSL transistors turned off, the bit line voltage of the cell to be programmed is set to 0V, while the bit line voltage to be inhibited programmed cell is set to Vcc. OV位线将相关联的单元NAND串的沟道连接到地。 OV bit line associated unit NAND string channel is connected to ground. 当编程电压Vpgm被施加到所选择的单元的栅极时，在栅极和沟道之间的大电势差导致电子FN隧穿到浮置栅上，对该单元编程。 When programming voltage Vpgm is applied to the gate of the selected cell, the large and the channel between the gate electrical potential difference causes the FN tunneling electrons onto the floating gate, the cell is programmed. 在编程禁止单元中(例如Vcc被施加到相应位线的单元)，位线初始地给相关联的沟道预充电。  In program inhibited cells (e.g., Vcc is applied to the bit line corresponding unit), to the channel initially associated precharging the bit lines. 当单元NAND串的字线电压升高到在被选择的字线处的编程电压Vpgm和升高到在未选择的字线处的通过电压Vpas s时，通过控制栅、浮置栅、沟道和体的串联电容被耦合并且沟道电势被自动地提升。 When the word line voltage of the unit NAND string rise to the program voltage Vpgm at the time and elevated to the word line is not selected by the word line voltage Vpas s is selected by the control gate, floating gate, channel and the series capacitor are coupled and the channel body potential is automatically lifted. 在编程禁止串中，当耦合的沟道电压升高到[Vcc-Vth] (Vth:SSL晶体管的阈值电压)时，SSL晶体管关断并且沟道变成浮置节点。  In the program inhibit string, when the coupled channel voltage rises to [Vcc-Vth] (Vth: threshold voltage of the SSL transistor) when, SSL transistor is turned off and the channel becomes a floating node. 该浮置沟道电压能够升高到栅极电压的大约80%。 The floating channel voltage can be raised to about 80% of the gate voltage. 因此，当编程电压Vpgm(例如在本实例的情境中的15.5-20伏)和通过电压(Vpass例如在本实例的情境中的10V)被施加到控制栅时，在本实例的情境中的编程禁止单元的沟道电压被提升到大约8V。 Thus, when the program voltage Vpgm is (e.g. 15.5-20 volts in the context of the present example), and when the voltage applied to the control gate through (Vpass e.g. 10V in the context of the present example), programming in the context of the present example a channel unit prohibiting voltage is raised to about 8V. 该高沟道电压阻止在编程禁止单元中发生FN隧穿。 This high channel voltage prevents the occurrence of the programming unit FN tunneling is prohibited. 使用该技术，由施加较高电压Vpi (在本实例的情境中的〜8V)到位线的要求引起的所有不足都能够被消除。 Using this technique, a higher voltage is applied to all insufficient Vpi (~8V In the context of the present example) is required due to the bit line can be eliminated. 图16是说明根据这里的实施例的块解码器的实例图。  FIG. 16 is a diagram illustrating an example block decoder of FIG embodiments herein. 注意到对于块解码器的电路实施有多种变化。 Note that for the block decoder circuit according to a variety of changes. 串选择线SSL、字线WLO到WL31、地选择线GSL和公共源极线CSL被经由传输晶体管TSS、TSO到TS31、TGS和TCS的公共信号SS、SO到S31、GS和CS来驱动，传输晶体管TSS、TSO到TS31、TGS和TCS共同地被块解码器的输出信号BD_out控制。  string selection line SSL, wordlines WLO to WL31, ground select line GSL and common source line CSL is via pass transistors TSS, TSO to TS31, TGS and the common signal SS TCS is, SO to S31, GS and CS to driving, transfer transistors TSS, TSO to TS31, TGS and TCS collectively output signal BD_out control block decoder. 本地电荷泵是高电压切换电路以用于控制传输晶体管TSS、TSO到TS31、TGS和TCS0其典型地包括增强型NMOS晶体管、耗尽型NMOS晶体管(DEP)、本征NMOS晶体管(native NMOS transistor) (NAT)和2输入端的NAND门。  the local charge pump is a high voltage switching circuit for controlling the transfer transistors TSS, TSO to TS31, TGS and TCS0 which typically includes enhancement NMOS transistor, depletion NMOS transistor (the DEP), native NMOS transistor (native NMOS transistor) (NAT) and a 2 input NAND gate. 当块解码器锁存输出BDLCH_out是Vdd、HVenb是OV且输入OSC在振荡(注意:本地电荷泵是公知的电路技术)时，块解码器的输出信号BD_out升高到Vhv。 When the block decoder latch output BDLCH_out is Vdd, HVenb OV and the input OSC is oscillating (note: the local charge pump is a well-known circuit techniques), the output signal BD_out block decoder is raised to Vhv. [0131 ] 当输入RST_BD脉冲高(短脉冲)时锁存输出BDLCH_out被复位到0V，并且在有效行预解码地址信号Xp、Xq、Xr和Xt的情况下，当输入LCHBD脉冲高(短脉冲)时解码地址被锁存。  When the input pulse RST_BD high (short pulse) BDLCH_out latch output is reset to 0V, and effective lines in the case of pre-decoded address signals Xp, Xq, Xr and Xt when the input LCHBD pulsed high (short pulse) when the decoded address is latched. 图17是说明根据这里的实施例的与存储器装置110相关联的方法的实例流程图1700。  FIG 17 is a diagram illustrating an example embodiment of the method herein a memory device 110 associated with the flow chart 1700. 通常，流程图1700记录如上讨论的一些概念。 Typically, a flowchart 1700 of records some of the concepts discussed above. 注意到在所有的流程图中的步骤顺序仅仅是示例性的，并且步骤通常能够以任意顺序被执行。 Note that in all of the sequence of steps in the flowchart are merely exemplary, and the steps can generally be performed in any order. 例如，没有理由认为下面的步骤1710必须在步骤1715之前，诸如此类。 For example, there is no reason to believe that the next step must be 1710 before step 1715, and so on. 在步骤1710中，存储器装置110接收电压Vcc。  In step 1710, the memory device 110 receives voltage Vcc. 在步骤1715中，存储器装置110使用电压Vcc以给在存储器装置110中的闪速存储器135提供功率。  In step 1715, the memory device 110 uses the voltage Vcc to the flash memory 135 to the memory device 110 to provide power. 在步骤1720中，存储器装置110接收电压Vpp。  In step 1720, the memory device receives voltage Vpp 110. 在步骤1725中，存储器装置110将电压Vpp转换成一个或多个内部电压V1、V2........Vk，其使能与闪速存储器135相关联的存储器控制操作。  In step 1725, the memory device 110 converts voltage Vpp into one or more internal voltages V1, V2 ........ Vk, which enables the control memory 135 associated with the operation of a flash memory. 图18是说明根据这里的实施例的与存储器装置110相关联的方法的实例流程图1800。  FIG. 18 is a diagram illustrating an example embodiment of the method herein a memory device 110 associated with the flow chart 1800. 通常，流程图1800记录如上讨论的一些概念。 Typically, a flowchart 1800 of records some of the concepts discussed above. 在步骤1810中，存储器装置110接收电压Vcc。  In step 1810, the memory device 110 receives voltage Vcc. 在步骤1815中，存储器装置110使用电压Vcc以给存储器135提供功率。  In step 1815, the memory device 110 uses the voltage Vcc to the memory 135 to provide power. 在步骤1820中，存储器装置110接收电压Vpp。  In step 1820, the memory device receives voltage Vpp 110. 在子步骤1830中，存储器装置110的功率管理电路120操作存在于与闪速存储器135为同一基板上的电源电路(例如电压转换器电路122)以产生大于Vpp的第一内部电压(例如Verase)。  In sub-step 1830, operation of the power management circuitry 120 of memory device 110 is present in the flash memory 135 is a power supply circuit (e.g., voltage converter circuitry 122) on the same substrate to produce a first internal voltage Vpp greater than the ( For example Verase). 在子步骤1835中，存储器装置110的功率管理电路120提供或者传送第一内部电压到存储器135。  In sub-step 1835, the power management circuitry 120 of memory device 110 or transmitted to provide a first voltage to the internal memory 135. 在子步骤1840中，存储器装置110的功率管理电路120操作存在于与闪速存储器为同一基板上的电压转换器电路122以产生大于Vpp的第二内部电压。  In sub-step 1840, operation of the power management circuitry 120 of memory device 110 is present in the flash memory 122 of the voltage converter circuit on the same substrate to produce a second internal voltage Vpp greater than the. 在子步骤1845中，存储器装置110提供第二内部电压(例如Vprogram)到存储器135。  In sub-step 1845, the memory device 110 provides the second internal voltage (e.g. Vprogram) to the memory 135. 图19是根据这里的实施例的与存储器系统500相关联的实例性流程图1900。  FIG. 19 is a flowchart of an example system 1900 and memory 500 associated with embodiments herein. 在步骤1910中，存储器装置110的用户、制造商、操作者、拥有者提供电压Vcc给存储器装置110以给存储器装置110中的闪速存储器提供功率。  In step 1910, the memory device user, manufacturer, operator 110, the owner provides the voltage Vcc to the memory device 110 to the memory device 110 to provide power to the flash memory. 在一个实施例中，这包括施加Vcc给存储器装置的第一引脚以给闪速存储器和/或相关电路提供功率。 In one embodiment, this includes applying Vcc to a first pin of the memory device to a flash memory, and / or associated circuitry provide power. 在步骤1915中，存储器装置110的用户、制造商、操作者、拥有者提供电压Vpp给存储器装置110以给在存储器装置110中的功率转换器电路提供功率。  In step 1915, the memory device user, manufacturer, operator 110 has to provide voltage Vpp to provide power to the power converter circuit in the memory device 110 to the memory device 110. 在一个实施例中，提供电压Vpp包括施加Vpp给存储器装置110的第二引脚。 In one embodiment, there is provided a second pin voltage Vpp includes applying Vpp to the memory device 110. 如讨论的那样，功率管理电路(例如功率转换器电路)接收Vpp并且将Vpp转换成一个或多个内部电压V1、V2........Vk,该内部电压被相应的闪速存储器135使用以支持数据管理操作。 As above, the power management circuitry (e.g., power converter circuitry) receives Vpp and converts Vpp into one or more internal voltages V1, V2 ........ Vk, the internal voltage in question is the corresponding flash memory 135 use to support data management operations. 例如，施加电压Vpp使能下面所选择的数据管理操作中的一个或多个:i)编程在闪速存储器中的单元，ii)擦除在闪速存储器中的单元，iii)从在闪速存储器中的单元中读取数据。 For example, a voltage Vpp is applied to enable the selected data management operations following one or more of: i) programming of cells in the flash memory, ii) erasing of cells in the flash memory, III) from the flash a memory cell read data. 能够对所描述的实施例进行一定的适应性改变和修改。  capable of a certain adaptations and modifications of the embodiments described herein. 因此，上面讨论的实施例被认为是说明性的而不是限制性的。 Accordingly, the above discussed embodiments are considered as illustrative and not restrictive. 1.一种存储器装置，包括: 用于保存数据的闪速存储器； 用于接收被用于给该闪速存储器供电的第一电压的第一功率输入端； 用于接收第二电压的第二功率输入端； 功率管理电路，其用于接收该第二电压并且获得传送给该闪速存储器的至少第一和第二内部电压，该功率管理电路包括: i )第一电荷泵电路，用于将该第二电压转换成高于该第二电压的第一内部电压，和ii)第二电荷泵电路，用于将该第二电压转换成高于该第一内部电压的第二内部电压；和其中该第二电压大于该第一电压。 1. A memory device, comprising: a flash memory for storing data; a first power input terminal for receiving a first voltage is used to power the flash memory; means for receiving a second voltage of the second input power; a power management circuit for receiving the second voltage and to obtain at least first and second internal voltage transferred to the flash memory, the power management circuit comprising: i) a first charge pump circuit, for the second voltage is converted into a first internal voltage higher than the second voltage, and ii) a second charge pump circuit, for converting the second voltage into the first internal voltage higher than the second internal voltage; and wherein the second voltage is greater than the first voltage. 2.根据权利要求1的存储器装置，其中传送给该闪速存储器的第一和第二内部电压中的至少一个使能从下列中所选择的至少一个: i)编程在该闪速存储器中的单元， ii)擦除在该闪速存储器中的单元，和iii)从在该闪速存储器中的单元中读取数据。 2. The memory device according to claim 1, wherein at least one of the following at least one selected from the first and second internal voltage transferred to the flash memory in: i) programming of the flash memory means, ii) erasing of the flash memory cell, and iii) reading data from the flash memory unit in. 3.根据权利要求1的存储器装置，其中该第一内部电压和第二内部电压支持对于该闪速存储器的数据存取操作。 3. The memory device according to claim 1, wherein the first internal voltage and the second internal voltage to the flash memory to support the data access operation. 4.根据权利要求1的存储器装置，其中该第一内部电压和第二内部电压被用于支持对于该闪速存储器的不同类型的数据存取操作。 4. The memory device of claim 1, wherein the first internal voltage and the second internal voltage are used to support different types of data to the flash memory access operations. 5.根据权利要求1的存储器装置，还包括: 参考发生器电路，用于产生第一参考和第二参考； 第一调节器电路，用于接收该第一参考和第一内部电压，该第一调节器电路产生指示该第一内部电压是否在调节内的输出；和第二调节器电路，用于接收该第二参考和第二内部电压，该第二调节器电路产生指示该第二内部电压是否被调节的输出。 5. The memory device of claim 1, further comprising: a reference generator circuit for generating a first reference and a second reference; a first regulator circuit for receiving the first reference voltage and a first interior of the first a regulator circuit generates the first internal voltage indicative of whether the regulated output; and a second regulator circuit for receiving the second internal voltage reference and a second, the second regulator circuit generates the second internal indicative whether the output voltage is regulated. 6.根据权利要求1的存储器装置，其中该闪速存储器包括用于保存位信息的单元，该单元包括衬底、栅极、源极和漏极。 6. The memory device according to claim 1, wherein the flash memory comprises a means for storing bits of information, the unit comprising a substrate, a gate, a source and a drain. 7.根据权利要求1的存储器装置，还包括: 基板； 该功率管理电路和该闪速存储器驻留在该基板上； 该基板包括: i )第一导电路径，用于将在该第一功率输入端上接收的该第一电压传送到该闪速存储器，和ii)第二导电路径，用于将在该第二功率输入端上接收的该第二电压传送到该功率管理电路。 7. The memory device of claim 1, further comprising: a substrate; The power management circuitry and the flash memory residing on the substrate; the substrate comprising: i) a first conductive path for power to the first transmitting the first voltage received on the input terminal to the flash memory, and ii) a second conductive path, for receiving the second voltage at the second input terminal of the power delivered to the power management circuitry. 8.根据权利要求7的存储器装置，其中该第一功率输入端是用于从在该存储器装置外部的第一电源接收该第一电压的该存储器装置的第一引脚；和其中该第二功率输入端是用于从在该存储器装置外部的第二电源接收该第二电压的该存储器装置的第二引脚。 8. The memory device according to claim 7, wherein the first power input is a first pin from the first memory means for receiving the first power supply voltage in the external memory device; and wherein the second power input is a second pin of the memory device receives the second voltage from a second power source external to the memory device. 9.根据权利要求1的存储器装置，其中该第一电压是Vcc且该第二电压是Vpp。 9. The memory device of claim 1, wherein the first voltage is Vcc and the second voltage is Vpp. 10.一种存储器系统，包括: 第一电压； 大于该第一电压的第二电压；和存储器装置，该存储器装置包括: i)由该第一电压供电的闪速存储器； ii)功率管理电路，其用于接收该第二电压并且将其转换成由闪速存储器使用的第一内部电压和第二内部电压； 该功率管理电路包括: i )第一电荷泵，用于将该第二电压转换成高于该第二电压的第一内部电压，和ii)第二电荷泵，用于将该第二电压转换成高于该第一内部电压的第二内部电压。 10. A memory system, comprising: a first voltage; a second voltage is greater than the first voltage; and a memory means, the memory means comprises: i) a flash memory of the first power supply voltage; ii) a power management circuit for receiving the second voltage and converts it into a first internal voltage used by flash memory and a second internal voltage; the power management circuit comprising: i) a first charge pump voltage for the second is converted into a first internal voltage higher than the second voltage, and ii) a second charge pump for converting the second voltage into the first internal voltage higher than the second internal voltage. 11.根据权利要求10的存储器系统，其中该闪速存储器使用由该功率管理电路产生的该第一内部电压和第二内部电压以管理保存在该闪速存储器中的数据。 11. The memory system of claim 10, wherein the flash memory using the first internal voltage and the second internal voltage generated by the power management circuitry to manage data stored in the flash memory. 12.根据权利要求10的存储器系统，还包括: 电路基板；· 该存储器装置驻留于该电路基板上； 该电路基板包括: i)第一导电路径，用于将来自第一电源的该第一电压传送到该存储器装置的第一功率输入引脚，和ii)第二导电路径，用于将来自第二电源的该第二电压传送到该存储器装置的第二功率输入引脚。 12. The memory system of claim 10, further comprising: a circuit board; - the memory device residing on the circuit board; a circuit board which comprises: i) a first conductive path, from the second to the first power source a voltage to the first power input pin of the memory device, and ii) a second conductive path for the second voltage from the second power source to a second power input pin of the memory device. 13.根据权利要求12的存储器系统，其中该第一功率输入引脚将该第一电压递送到该存储器装置的该闪速存储器；和其中该第二功率输入引脚将该第二电压递送到该存储器装置的该功率管理电路。 13. The memory system of claim 12, wherein the first power input pin to deliver voltage to the first of the flash memory of the memory device; and wherein the second power input pin to deliver voltage to the second the power management circuitry of the memory device. 14.根据权利要求11的存储器系统，其中由该功率管理电路产生的该第一内部电压和第二内部电压使能从下列中所选择的至少一个: i )编程在该闪速存储器中的单元， ii)擦除在该闪速存储器中的单元，和iii)从在该闪速存储器中的单元中读取数据。 14. The memory system of at least one of claim 11, the first internal voltage and wherein the second internal voltage generated by the power management circuit causes selected from the following: i) programming unit in the flash memory , ii) erasing of the flash memory cell, and iii) reading data from the flash memory unit in. 15.根据权利要求11的存储器系统，其中该存储器装置是在该存储器系统中的多个存储器装置之一，每一个存储器装置被配置成接收该第一电压和该第二电压，每一个存储器装置包括:i)由该第一电压供电的相应的闪速存储器，和ii)用于将该第二电压转换成一组较高的内部电压的相应的功率管理电路，该相应的闪速存储器使用该组较高的内部电压以管理在其中的数据。 15. A memory system according to claim 11, each of the memory devices wherein the memory device is one of a plurality of memory devices in the memory system, each of the memory device is configured to receive the first voltage and the second voltage, comprising: i) a respective flash memory to the first power supply voltage, and ii) means for converting the second voltage into a corresponding set of higher internal voltages of the power management circuits of the flash memory using the corresponding group to manage the higher internal voltage data therein. 16.根据权利要求1的存储器装置，其中该第一电压为1.8伏或3.3伏，并且该第二电压大于大约5伏。 16. The memory device of claim 1, wherein the first voltage is 1.8 volts or 3.3 volts and the second voltage is greater than about 5 volts. 17.根据权利要求1的存储器装置，还包括: 第一导电路径，用于将该第一内部电压传送到该闪速存储器；和第二导电路径，用于将该第二内部电压传送到该闪速存储器。 17. The memory device of claim 1, further comprising: a first electrically conductive path to the first internal voltage to the flash memory; and a second conductive path for the voltage to the second internal flash memory. 18.根据权利要求1的存储器装置，其中将该第二电压转换成该第一内部电压和第二内部电压的功率转换效率高于将该第一电压转换成该第一内部电压和第二内部电压的功率转换效率。 18. The memory device of claim 1, wherein the converting the second voltage into the power conversion efficiency of the first and second internal voltage higher than the internal voltage to convert the first voltage into the first internal voltage and the second internal voltage of the power conversion efficiency. 19.根据权利要求1的存储器装置，其中该功率管理电路包括多级电荷泵以用于接收该第二电压并且产生该第二内部电压，该多级电荷泵具有用于将该第二电压转换成该第二内部电压所需要的级数少于用于将该第一电压转换成该第二内部电压所需要的级数。 19. The memory device of claim 1, wherein the power management circuit comprises a multi-stage charge pump for receiving the second voltage and to generate the second internal voltage, which has a multi-stage charge pump for the second voltage converter the internal voltage to a second number of stages is less than required for converting the first voltage into a second series of the internal voltage required. 20.根据权利要求1的存储器装置，还包括输入/输出逻辑，用于提供对保存在该闪速存储器中的数据的存取，该输入/输出逻辑由第一电压供电。 20. The memory device of claim 1, further comprising an input / output logic for providing access to data stored in the flash memory, and the input / output logic of the first supply voltage. 21.根据权利要求1的存储器装置，其中该功率管理电路接收该第一电压以给在该功率管理电路中的除了第一电荷泵电路和第二电荷泵电路之外的至少一部分电路供电。 21. The memory device of claim 1, wherein the power management circuit receives the first voltage supply circuit to send at least a portion of the power management circuitry in addition to the first charge pump circuit and a second charge pump circuit. 22.根据权利要求1的存储器装置，还包括: 开关电路，用于选择使用该第一电压或使用该第二电压以用于产生该第一内部电压和该第二内部电压。 22. The memory device of claim 1, further comprising: a switch circuit for selecting using the first voltage or the second voltage for generating the first internal voltage and the second internal voltage. 23.根据权利要求1的存储器装置，还包括: 配置寄存器，用于指定该第一电压或该第二电压中的哪一个用于产生该第一内部电压和该第二内部电压。 23. The memory device of claim 1, further comprising: a configuration register that specifies the first voltage or a second voltage which is used to generate the first internal voltage and the second internal voltage. 24.根据权利要求10的存储器系统，其中该存储器装置是存储器系统中的多个存储器装置之一，该存储器系统包括第一导电路径和第二导电路径，该第一导电路径用于将该第一电压传送到该多个存储器装置中的每一个，该第二导电路径用于将该第二电压传送到该多个存储器装置中的每一个。 24. The memory system according to claim 10, wherein the memory device is one of a plurality of memory devices in a memory system, the memory system including a first conductive path and second conductive paths, the first conductive path for the first a voltage to each of the plurality of memory devices, the second conductive path for conveying the second voltage to each of the plurality of memory devices. 25.根据权利要求24的存储器系统，还包括: 功率转换器，用于将输入电压转换成该第一电压和该第二电压。 25. The memory system of claim 24, further comprising: a power converter for converting an input voltage into the first voltage and the second voltage. 26.根据权利要求1的存储器装置，还包括: 振荡器，用于产生主时钟信号； 第一驱动器电路，用于接收该主时钟信号并且使用该主时钟信号产生用于控制该第一电荷泵电路操作的信号；和第二驱动器电路，用于接收该主时钟信号并且使用该主时钟信号产生用于控制该第二电荷泵电路操作的信号。 26. The memory device of claim 1, further comprising: an oscillator for generating a master clock signal; a first driver circuit for receiving the master clock signal and uses the master clock signal for generating the first charge pump control signal circuit operation; and a second driver circuit for receiving the master clock signal and uses the master clock signal to generate a signal for controlling the operation of the second charge pump circuit. 27.根据权利要求1的存储器装置，其中该闪速存储器包括用于保存位信息的单元，该单元包括衬底、栅极、源极、和漏极；和其中该闪速存储器通过施加:地电势到该栅极、开路到该漏极、开路到该源极、和该第二内部电压到该衬底来擦除该单元。 27. The memory device of claim 1, wherein the flash memory comprises a means for storing bits of information, the unit comprising a substrate, a gate, a source, and a drain electrode; and wherein the flash memory by applying: to to the potential of the gate to open the drain open to the source, and the second internal voltage to the substrate to erase the cell. 28.根据权利要求1的存储器装置，其中该闪速存储器包括用于保存位信息的单元，该单元包括衬底、栅极、源极、和漏极；和其中该闪速存储器通过施加该第一内部电压到该栅极并且施加地电势到该漏极、源极和衬底中的每一个来编程该单元。 28. The memory device of claim 1, wherein the flash memory comprises a means for storing bits of information, the unit comprising a substrate, a gate, a source, and a drain electrode; and wherein the flash memory by applying the second an internal voltage applied to the gate and ground potential to the drain, source and substrate each one of the programmed cell. 29.根据权利要求1的存储器装置，其中该闪速存储器包括用于保存位信息的单元，该单元包括衬底、栅极、源极、和漏极；和其中该闪速存储器通过施加该第一内部电压到该漏极并且施加地电势到该栅极、源极和衬底中的每一个来读取该单元。 29. The memory device of claim 1, wherein the flash memory comprises a means for storing bits of information, the unit comprising a substrate, a gate, a source, and a drain electrode; and wherein the flash memory by applying the second an internal voltage to the drain and applying a ground potential to the gate, a source and a substrate to each of the reading unit. 30.根据权利要求11的存储器系统，其中该闪速存储器包括用于保存位信息的单元，该单元包括衬底、栅极、源极、和漏极；和其中该闪速存储器通过施加该第二内部电压到该漏极并且施加地电势到该栅极、源极和衬底中的每一个来读取该单元。 30. The memory system of claim 11, wherein the flash memory comprises a means for storing bits of information, the unit comprising a substrate, a gate, a source, and a drain electrode; and wherein the flash memory by applying the second two internal voltage to the drain and applying a ground potential to the gate, a source and a substrate to each of the reading unit. 31.根据权利要求1-9、16-23以及26-29中任一所述的存储器装置，其中所述闪速存储器是NAND闪速存储器。 31. 1-9,16-23 and a memory device according to any one of claims 26-29, wherein the flash memory is a NAND flash memory. 32.—种存储器装置，包括: 用于保存数据的非易失性存储器； 用于接收第一电压给该非易失性存储器供电的第一功率输入端； 用于接收第二电压的第二功率输入端，该第二电压大于该第一电压； 功率管理电路，其用于接收该第二电压并且获得用于控制对该非易失性存储器内的数据的存取的至少第一内部电压和第二内部电压，该功率管理电路包括: i)第一电路，用于将该第二电压转换成该第一内部电压，该第一内部电压大于该第二电压，和ii)第二电路，用于将该第二电压转换成该第二内部电压，该第二内部电压大于该第一内部电压。 32.- species memory device, comprising: a nonvolatile memory for storing data; means for receiving a first voltage to a first input terminal of the power supply of the non-volatile memory; means for receiving a second voltage of the second power input, the second voltage is greater than the first voltage; power management circuit for receiving the second voltage and to obtain at least a first internal voltage for controlling access to the data in the nonvolatile memory and a second internal voltage, the power management circuit comprising: i) a first circuit for converting the second voltage into the first internal voltage, the first internal voltage is greater than the second voltage, and ii) a second circuit for converting the second voltage into the second internal voltage, internal voltage and the second voltage is greater than the first internal. 33.一种存储器装置，包括: 能够保存数据的非易失性存储器； 使能存取该非易失性存储器中的数据的输入/输出逻辑； 用于接收第一电压的第一输入端，该第一电压给该输入/输出逻辑供电； 用于接收第二电压的第二输入端；和功率管理电路，其能够接收该第二电压并且将该第二电压转换成多个内部电压，所述多个内部电压包括第一内部电压，其大于所述第二电压，并且所述多个内部电压还包括第二内部电压，其大于所述第一内部电压；和其中通过该功率管理电路提供的所述多个内部电压来使能对在该非易失性存储器中的数据的修改。 33. A memory device, comprising: a nonvolatile memory capable of holding data; input / output logic can access the data in the nonvolatile memory; a first input terminal for receiving a first voltage, the first voltage to the input / output logic power; a second input for receiving a second voltage; and a power management circuit capable of receiving the second voltage and converts the voltage into a second plurality of internal voltages, the said plurality of internal voltages comprises a first internal voltage, which is greater than the second voltage, and the internal voltage further comprises a plurality of second internal voltage that is greater than said first internal voltage; and wherein the power management circuit is provided by the plurality of internal voltages to enable modification of the data in the nonvolatile memory of. 34.根据权利要求33的存储器装置，还包括: 半导体芯片封装，其至少容纳该非易失性存储器、该输入/输出逻辑和该功率管理电路。 34. The memory device of claim 33, further comprising: a semiconductor chip package, which houses at least the non-volatile memory, the input / output logic and the power management circuitry. 35.根据权利要求33的存储器装置，还包括: 封装，其至少容纳该非易失性存储器、该输入/输出逻辑和该功率管理电路； 该封装包括用于接收第一电压的第一导电引线，该第一导电引线将该第一电压从第一外部电源传送给在该存储器装置内的该输入/输出逻辑；和该封装包括用于接收第二电压的第二导电引线，该第二导电引线将该第二电压从第二外部电源传送给在该存储器装置内的该功率管理电路。 35. The memory device of claim 33, further comprising: a package which houses at least the non-volatile memory, the input / output logic and the power management circuitry; the package comprises a first conductive lead for receiving a first voltage, the first conductive lead to the first voltage input of the memory device in the I / O transfer from the first external power supply logic; and the package includes a second conductive lead for receiving a second voltage, the second conductive the second leads from the second external voltage transfer power to the power management circuitry in the memory device. 36.根据权利要求35的存储器装置，其中该封装是安装在电路板上的集成电路封装。 36. The memory device of claim 35, wherein the packaged integrated circuit package is mounted on a circuit board. 37.根据权利要求33的存储器装置，其中该非易失性存储器是闪速存储器。 37. The memory device of claim 33, wherein the non-volatile memory is a flash memory. 38.根据权利要求33的存储器装置，其中该功率管理电路包括:功率转换器，用于将该第二电压转换成该第一内部电压，以及用于将该第二电压转换成该第二内部电压。 38. The memory device of claim 33, wherein the power management circuit comprising: a power converter for converting the second voltage into the first internal voltage, and means for converting the second voltage into the second interior Voltage. 39.根据权利要求38的存储器装置，其中该第一内部电压支持对于该非易失性存储器的存储器单元内的数据的写入操作；和其中该第二内部电压支持对于该非易失性存储器的存储器单元内的数据的擦除操作。 39. The memory device of claim 38, wherein the first internal voltage to support the writing operation of the data in the memory cell of the nonvolatile memory; wherein the second internal voltage and a support for the non-volatile memory erasing data in a memory cell operation. 40.根据权利要求33的存储器装置，其中该非易失性存储器包括能够保存数据的多个存储器单元；和其中该第一电压给该非易失性存储器供电以用于通过该输入/输出逻辑检索数据。 40. The memory device of claim 33, wherein the nonvolatile memory includes a plurality of memory cells capable of storing data; and wherein the first voltage supply to the non-volatile memory of the input / output logic for by retrieve data. 41.根据权利要求33的存储器装置，其中所述第二内部电压支持对于该非易失性存储器的存储器单元内的数据的擦除操作； 所述第一内部电压支持对于该非易失性存储器的存储器单元内的数据的编程操作；和所述多个内部电压中的第三内部电压支持对于该非易失性存储器的存储器单元内的数据的读取操作。 41. The memory device of claim 33, wherein said second inner supports for the data voltage in the memory cell of the nonvolatile memory erase operation; support for said first internal voltage to the non-volatile memory programming operation data in the memory cells; and a third internal voltage of said plurality of internal support voltages for the data read operation in the memory cell of the nonvolatile memory. 42.根据权利要求41的存储器装置，其中第一功率输入端是该存储器装置的第一输入引脚，该第一输入引脚接收来自在该存储器装置外部的第一电源的第一电压；和其中第二功率输入端是该存储器装置的第二输入引脚，该第二输入引脚接收来自在该存储器装置外部的第二电源的第二电压。 42. The memory device of claim 41, wherein the first power input is a first input pin of the memory device, the first input pin receives a first voltage at the first power source external to the memory means; and wherein the second input is a second power input pin of the memory device, the second input of the second pin receives the voltage from a second power source in the external memory device. 44.根据权利要求33的存储器装置，其中该功率管理电路包括多级电荷泵电路以用于接收该第二电压和产生该第一内部电压。 44. The memory device of claim 33, wherein the power management circuit comprises a multi-stage charge pump circuit for receiving the second voltage and generating the first internal voltage. 45.根据权利要求33的存储器装置，其中该功率管理电路接收该第一电压以便给在该功率管理电路中的除了电荷泵电路之外的至少一部分电路供电。 45. The memory device of claim 33, wherein the power management circuit receives the first voltage supply circuit so as to at least a portion of the power management circuitry in addition to the charge pump circuit. 46.一种存储器装置，包括: 能够保存数据的非易失性存储器； 用于接收第一电压的第一输入端引脚，该第一电压给该非易失性存储器供电，使能存取该非易失性存储器的数据； 用于接收第二电压的第二输入端引脚，所述第二电压大于所述第一电压；和功率管理电路，其能够接收该第二电压并且将该第二电压转换成多个内部电压，所述多个内部电压包括第一内部电压，其大于所述第二电压，并且所述多个内部电压还包括第二内部电压，其大于所述第一内部电压；和其中利用由该功率管理电路提供的至少一个内部电压来使能对在该非易失性存储器中的数据的修改。 46. ​​A memory device, comprising: a nonvolatile memory capable of holding data; means for receiving a first input voltage of a first pin, the first voltage supply to the non-volatile memory, enabling access data of the nonvolatile memory; means for receiving a second input pin of the second voltage, the second voltage is greater than the first voltage; and a power management circuit capable of receiving the second voltage and the a second voltage into a plurality of internal voltage, internal voltage includes a first plurality of said internal voltage, which is greater than the second voltage, and the internal voltage further comprises a plurality of second internal voltage that is greater than the first internal voltage; and wherein using at least one internal voltage provided by the power management circuitry to enable modification of the data in the nonvolatile memory of. 47.一种用于在存储器装置的输入端接收电压的方法，所述方法包括: 接收第一电压，该第一电压是在所述存储器装置的第一输入端上被接收的； 使用该第一电压给该存储器装置的输入/输出逻辑供电，该输入/输出逻辑使能对保存在该存储器装置的非易失性存储器中的数据的存取； 接收第二电压，该第二电压大于所述第一电压，该第二电压是在该存储器装置的第二输入端上被接收的；和通过该存储器装置内的功率管理电路，将该第二电压转换成多个内部电压，所述多个内部电压包括第一内部电压，其大于所述第二电压，并且所述多个内部电压还包括第二内部电压，其大于所述第一内部电压；和通过由该功率管理电路提供的多个内部电压，使能对在该非易失性存储器内的数据的修改。 47. A method for receiving a voltage at the input of the memory device, the method comprising: receiving a first voltage, the first voltage being received at the first input of the memory device; the use of a voltage to the memory device input / output logic power supply, the input / output logic to enable access to the data stored in the nonvolatile memory of the memory device; receiving a second voltage, the second voltage is greater than the said first voltage, the second voltage is being received at the second input of the memory device; and by the power management circuitry within the memory device, the second voltage into a plurality of internal voltage, said plurality internal voltage includes a first internal voltage, which is greater than the second voltage, and the internal voltage further comprises a plurality of second internal voltage that is greater than said first internal voltage; and provided by the power management circuitry of the multi- internal voltage, enabling the modification of the data in the nonvolatile memory. 48.根据权利要求47的方法，其中接收该第一电压包括在该存储器装置的第一导电引线上接收该第一电压，该第一导电引线将来自第一电压源的该第一电压传输给在该存储器装置中的输入/输出逻辑，该第一电压源在该存储器装置的外部；和其中接收该第二电压包括在该存储器装置的第二导电引线上接收该第二电压，该第二导电引线将来自第二电压源的该第二电压传输给在该存储器装置中的该功率管理电路，该第二电压源在该存储器装置的外部。 48. The method according to claim 47, wherein the receiving includes receiving a first voltage at the first voltage on a first conductive leads of the memory device, the first conductive lead to the first voltage from the first voltage source to the transmission It means in the memory input / output logic, the first voltage source external to the memory device; and a second voltage wherein the receiving includes receiving the second voltage on the second conductive lead of the memory device, the second the conductive lead transmission from the second voltage to the second voltage source in the memory device, the power management circuit, the second voltage source external to the memory device. 49.根据权利要求47的方法，其中使能对在该非易失性存储器中的数据的修改包括使能对在该非易失性存储器中的闪速存储器的修改。 49. The method according to claim 47, wherein the enable modification of the data in the nonvolatile memory comprises flash memory can be modified in the nonvolatile memory of. 50.根据权利要求47的方法，还包括: 使用该第一内部电压以执行对于该非易失性存储器的存储器单元内的数据的写入操作；和使用该第二内部电压以执行对于该非易失性存储器的存储器单元内的数据的擦除操作。 50. The method of claim 47, further comprising: using the first internal voltage to perform the write operation for the data in the memory cell of the nonvolatile memory; and using the second internal voltage to perform the non-for erase operation data in the memory cell is a volatile memory. 51.根据权利要求47的方法，还包括: 保存数据到该非易失性存储器的存储器单元中；和利用该第一电压给该非易失性存储器供电以便使能通过该输入/输出逻辑从该存储器单元中检索数据。 51. The method of claim 47, further comprising: saving data to the memory cells of the nonvolatile memory; and using the first voltage to the non-volatile memory so that the power supply via the input / output logic from retrieve the data of the memory cell. 52.根据权利要求47的方法，还包括:利用该第一电压给该非易失性存储器供电。 52. The method of claim 47, further comprising: using the first voltage supply to the non-volatile memory. 53.根据权利要求47的方法，其中所述第二内部电压支持对于该非易失性存储器的存储器单元内保存的数据的擦除操作； 所述第一内部电压支持对于该非易失性存储器的存储器单元内保存的数据的编程操作；和所述多个内部电压中的第三内部电压支持对于该非易失性存储器的存储器单元内保存的数据的读取操作。 53. The method of claim 47, wherein said second erase operation supports internal voltage stored in the inner memory cells of the nonvolatile memory data; support for said first internal voltage to the non-volatile memory stored in the memory cell programming operation data; and a plurality of third internal voltage support of the internal voltage for read operations in the memory cell stored in the nonvolatile memory data. 54.根据权利要求47的方法,其中在该存储器装置的第一输入端上接收该第一电压包括在该存储器装置的第一功率输入引脚上接收该第一电压，该第一功率输入引脚接收来自在该存储器装置外部的第一电源的该第一电压；和其中在该存储器装置的第二输入端上接收该第二电压包括在该存储器装置的第二功率输入引脚上接收该第二电压，该第二功率输入引脚接收来自在该存储器装置外部的第二电源的该第二电压。 54. The method according to claim 47, wherein the receiving includes receiving the first voltage at a first voltage on a first power input pin of the memory device at the first input terminal of the memory device, the first power input lead pin receives the first voltage from a first power source external to the memory device; and wherein the receiving comprises receiving the second voltage at the second power input pin of the memory device on a second input of the memory device a second voltage, the second power input pin for receiving the second voltage from the external power source of the second memory device. 55.根据权利要求47的方法,其中该第二电压的幅值基本上大于该第一电压的幅值。 55. The method according to claim 47, wherein the amplitude of the second voltage is substantially greater than the magnitude of the first voltage. 56.根据权利要求47的方法,其中将该第二电压转换成多个内部电压包括: 执行多级电荷泵电路以接收该第二电压并且将该第二电压转换成该多个内部电压。 56. The method according to claim 47, wherein the converting the second voltage into a plurality of internal voltages comprising: performing a multi-stage charge pump circuit to receive the second voltage and converts the voltage into a second of the plurality of internal voltages. 57.—种用于在存储器芯片的输入端接收电压的方法,所述方法包括:将数据保存在非易失性存储器中； 通过所述存储器芯片的第一输入端接收第一电压； 利用该第一电压给该存储器芯片中的该非易失性存储器供电，以使能对保存在该非易失性存储器中的数据的存取； 通过该存储器芯片的第二输入端接收第二电压，该第二电压大于该第一电压； 将该第二电压转换成在该存储器芯片中的多个内部电压，所述多个内部电压包括第一内部电压，其大于所述第二电压，并且所述多个内部电压还包括第二内部电压，其大于所述第一内部电压；和利用该多个内部电压来修改保存在该非易失性存储器中的数据。 57.- method for a memory chip receives a voltage input terminal, the method comprising: the data stored in the nonvolatile memory; receiving a first voltage through a first input terminal of said memory chip; using the a first voltage supply to the non-volatile memory of the memory chip, to enable access to the data stored in the nonvolatile memory; receiving a second voltage to a second input terminal of the memory chip, the second voltage is greater than the first voltage; converting the second voltage into a plurality of internal voltages in the memory chip, the plurality of internal voltage comprises a first internal voltage, which is greater than the second voltage, and the further comprising a plurality of internal voltages of said second internal voltage that is greater than said first internal voltage; and a plurality of internal voltages by using the modified data stored in the nonvolatile memory. JP4199497B2 (en) 2008-12-17 Nonvolatile semiconductor memory device and its programming method. Owner name: CONVERSANT INTELLECTUAL PROPERTY MANAGEMENT INC.
Free format text: FORMER NAME: MOSAID TECHNOLOGIES INC.